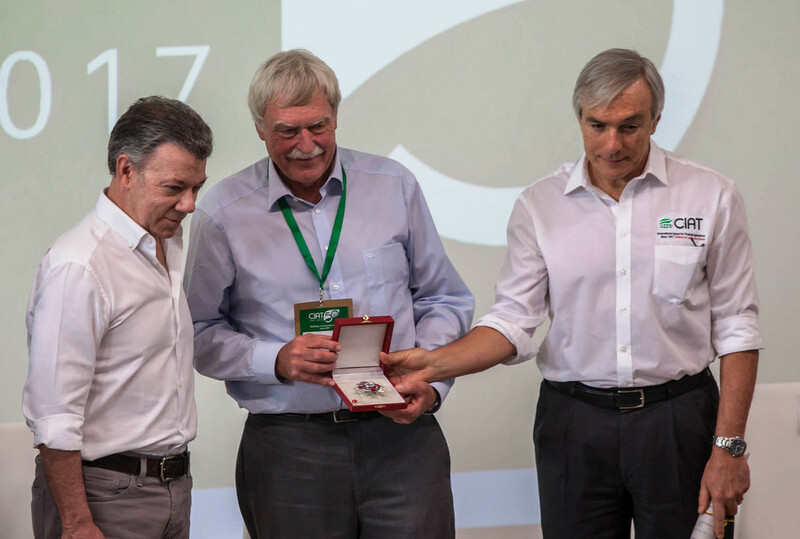 President Santos of Colombia presents CIAT Board Chair, Geoffrey Hawtin, and Director General, Ruben Echeverría, with the National Order for Merit in the degree of Silver Cross during CIAT’s 50 anniversary celebration (Nov. 2017). CIAT, building off 50 years of success in generating and strategically positioning knowledge to improve agricultural practices, reduce poverty and hunger, and improve human nutrition, continues to play a key role in addressing the world’s most pressing challenges related to agriculture, development, and the environment. During our recent 50th anniversary celebrations, time and time again, we heard our partners, supporters, and colleagues reference our ability to adapt and innovate. This is clearly a hallmark of CIAT’s approach to research for development. 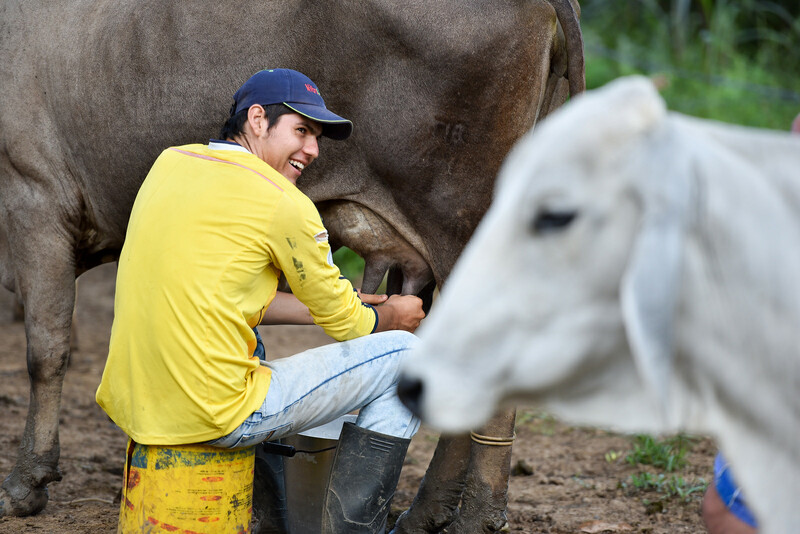 CIAT also contributes to: Forests, Trees and Agroforestry | Livestock | Rice | Roots, Tubers and Bananas. A back-up copy of 94% of CIAT’s bean collections and 92% of its forage collections are also kept in the “Doomsday seed vault” at 120 meters of depth in a mountain of the Norwegian archipelago of Svalbard. The latest shipment to Svalbard was sent in February 2018 on the occasion of #SeedVault10. Zoom in on the map to see more details. 4236 varieties (7705 samples) distributed to 16 countries 54 varieties (66 samples) distributed to 6 countries 536 varieties (579 samples) distributed to 10 countries Any combination of bean / cassava / forage samples. Mouse over the bubbles for details. Dr. Louis Verchot, director of CIAT’s Soils and Landscapes for Sustainability Research Area, joined experts from 52 countries as a lead author of the Intergovernmental Panel on Climate Change (IPCC) Special Report on Climate Change and Land. Dr. Ngonidzashe Chirinda, CIAT soil specialist, is also serving as a lead author with a team of scientists working on a new methodology report that will refine the 2006 IPCC Guidelines for the National Greenhouse Gas Inventories. The refined guidelines aim to help countries meet their pledge to the 2015 Paris Agreement to limit the increase in global average temperature to 1.5 degrees Celsius above pre-industrial levels. The IPCC assessment reports are widely regarded as the most authoritative summary of the state of knowledge about climate change, its current and potential future impacts, and the possibilities for adapting to change and reducing emissions. Both the IPCC special report and the updated guidelines on national GHG inventories are due out in 2019. 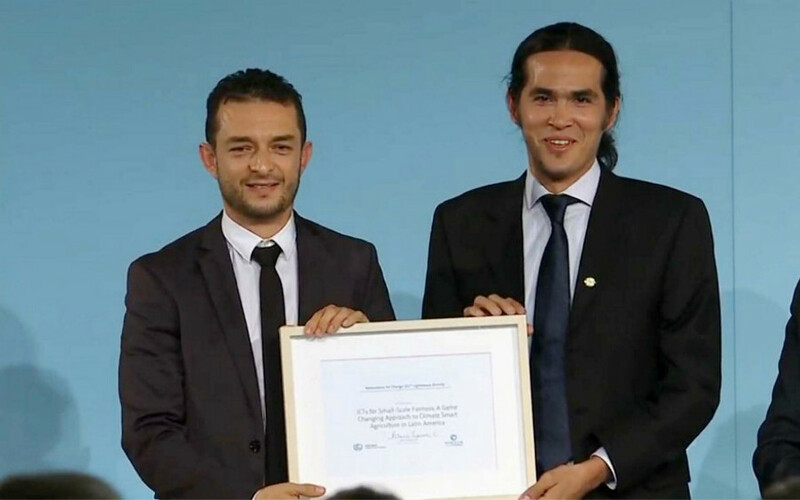 Dr. Ramírez and Dr. Jiménez received one of the prizes of the coveted 2017 Momentum for Change Lighthouse Activities from the United Nations Framework Convention on Climate Change (UNFCCC) during an award ceremony at COP23 in Bonn, Germany. They received the prize in the Information and Communications Technology (ICT) Solutions category and represented a team of 30-plus researchers from CIAT and CCAFS, which works on ICT to benefit small-scale farmers. In particular, they develop climate and agricultural forecasts for farmers using big data techniques. This groundbreaking approach is known as climate services. Since 2013, the team has worked with government institutions at national and local levels, national growers associations, and weather agencies in Latin America, particularly Colombia and Honduras, to provide farmers with advice on which crops to grow, and if and when to plant. The farmers were then able to choose the action that best suited their needs. So far, this work has reached an estimated 300,000 farmers in the two countries. 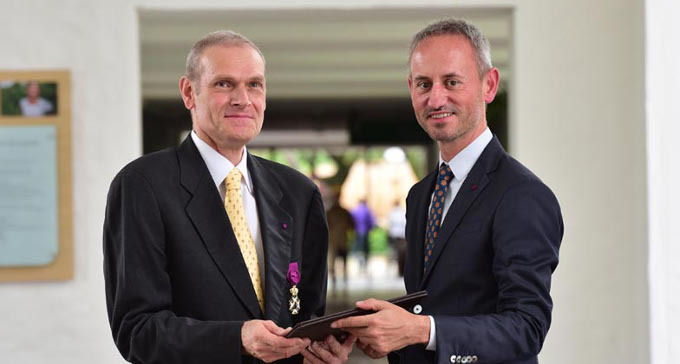 Dr. Daniel Debouck received in July 2017 the Order of Leopold, the highest recognition that the Kingdom of Belgium bestows. Dr. Debouck is the world’s expert in Phaseolus, common bean, germplasm. In his nearly 40 years of work, a large part of them as leader of CIAT’s Genetic Resources Program, he has collected 3,900 new varieties of flora in 38 expeditions through 11 countries of Latin America and has discovered 14 new species. Some of the species that he collected are new to science and are key to current and future breeding efforts. 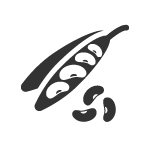 A species of bean was also named Phaseolus debouckii after him in “Phytotaxa,” a taxonomic journal. Dr. Debouck was the first to discover this species during a field expedition in Peru in 1989 and its uniqueness was confirmed recently. The name honors Dr. Debouck for his scholarly contributions, and extensive and systematic collections of wild and domesticated Phaseolus throughout the Americas. Besides his expertise in Phaseolus, Dr. Debouck is one of the leading technical experts in agrobiodiversity conservation. Dr. Debouck also received in February 2018 the inaugural Crop Trust Legacy Award recognizing “global gatekeepers” of crop diversity. Prof. Ruth Oniang’o, former Member of Parliament for Kenya, and a leading advocate on nutrition in Africa, served as a member of the CIAT Board of Trustees from 2012 to 2015. She is co-winner of 2017 Africa Food Prize, jointly with agricultural entrepreneur Maïmouna Sidibe Coulibaly, from Mali. The duo received the award at the opening ceremony of the 7th African Green Revolution Forum for their outstanding contributions to agriculture and food production towards a sustainable food future in Africa. 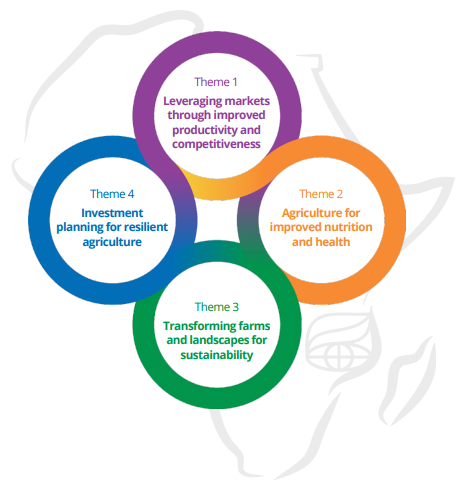 Working at different ends of agricultural value chains, their work has addressed multiple challenges to improve food and nutrition security across the continent. They will share the US$100,000 prize money. Prof. Oniang’o, currently Editor-in-Chief and Founder at African Journal of Food, Agriculture, Nutrition and Development (AJFAND), is recognized as a leading voice on nutrition. Her scientific research to advance agricultural productivity is matched with a deep understanding of the challenges farmers face, especially women, and she has worked with communities and policy makers to improve access to higher yielding crops and markets. 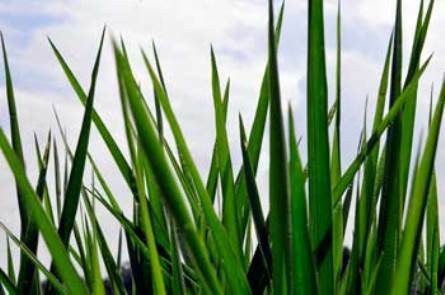 We already knew that Brachiaria had the capacity to fix nitrogen (N) thanks to a compound released by their roots called brachialactone, which prevents the conversion of N into nitrous oxide (N2O) – a greenhouse gas 300 times more potent than carbon dioxide. The process is called biological nitrification inhibition (BNI), and it traps N in the soil in a form that plants can use as a nutrient. What we did not know is exactly how much nitrogen the grass could fix. An experiment involving spreading cow pee – which is naturally high in nitrogen – on patches planted to different types of Brachiaria revealed that high-BNI Brachiaria emitted 60% less N2O than the low-BNI plants. Trapping some nitrogen in the soil thanks to BNI could save farmers money on fertilizer, slash greenhouse gas emissions on farms, and improve the health of the landscape all at once. And while brachialactone is unique to Brachiaria, BNI is not. Scientists across CGIAR are trying to unlock BNI capacity in staple crops, including wheat and sorghum, with potentially significant global benefits. CIAT scientists recently used DNA fingerprinting, which analyzes the genetic characteristics or the unique identity of organisms, in this case cassava, to get a clearer picture of the adoption of CIAT-bred varieties and, ultimately, enhance advice to farmers on how to better manage their crops. Together with the Colombian Corporation for Agricultural Research (CORPOICA), CIAT has produced 16 improved varieties of cassava over the last 8 years. Researchers collected 434 stem samples from 217 farmers in Cauca, Colombia, and DNA fingerprinting identified 120 varieties, 9 of which were improved cassava varieties. The study revealed disparities in perceived and actual use of landraces versus improved cassava. Roughly 17% of the households surveyed said they were cultivating improved varieties, but DNA profiling discovered that about 9% actually did so. DNA fingerprinting allows us to better measure CIAT’s impact and will help improve dissemination strategies of improved varieties. Researchers from eight Asian countries – Bangladesh, Cambodia, China, India, Laos, Myanmar, Philippines, and Vietnam – gathered on 12–13 December 2017 in Haikou City, China, to form the Asian Forage Legumes Network. This is in response to the increasing pressure for farming systems in Asia to produce more without causing further harm to the environment. As soils deteriorate and become unable to provide the nitrogen that crops need, nitrogen-fixation from the atmosphere turns out to be very important in agriculture. And the most important nitrogen-fixing agents in agricultural systems are the symbiotic – mutually beneficial – associations between crop, forage legumes, and rhizobia – the nitrogen-fixing bacteria that camp inside the root nodules of legumes. In addition to fixing atmospheric nitrogen (N), intercropped legumes contribute to enhancing soil carbon content through the leaves and root systems that remain in the field after harvest. When used as green manure, multipurpose legumes help in mitigation of soil erosion by providing a better soil cover. Beyond facilitating soil health, when used as forages, legumes provide high-quality livestock feed. The network aims to further the understanding of and promote biological nitrogen fixation within the region. For the first time, a study looks at the relationship between coffee, bees, and climate change. We knew that rising temperatures and shifting precipitation patterns caused by climate change could reduce the suitability of lands for growing coffee in Latin America — the world’s largest coffee-producing region — by as much as 88% by 2050. But the study forecasts much greater losses in coffee suitability than previous assessments, with the largest projected for Nicaragua, and Honduras. This is because bees, which pollinate coffee, will be impacted by climate change as well, and their populations may decline even in coffee-growing areas likely to remain suitable for coffee. Without the services that bees provide through pollination, coffee yields will drop, and this will directly affect the incomes of thousands of vulnerable smallholder farmers and the coffee supply chain at large. The models created to make these projections are a valuable tool for informing policy-making and targeting appropriate management practices such as forest conservation and shade adjustment. A new CIAT initiative funded by the Graham Sustainability Institute at the University of Michigan is using big data approaches to contribute to more informed decisions for improving the sustainability of diets. CIAT and researchers at the University of Michigan have defined sustainable diets as those that are “protective and respectful of biodiversity and ecosystems; culturally acceptable, accessible, economically fair and affordable; nutritionally adequate, safe and healthy; while optimizing natural and human resources.” The initiative aims to generate insights into the policy process in Kenya and Vietnam, including by identifying potential policy levers that may be effective for shifting the food system towards sustainability. It will help us understand, from the consumer level to the regional level and all the way to the global level, how food is produced and how it ends up on the consumer’s plate. International agricultural research centers such as CIAT have the mandate to build national research capacity in the countries where they work. Without such capacity among national research institutes, universities, producer associations, private sector, and others we won’t be able to achieve the ambitious impacts we strive for. 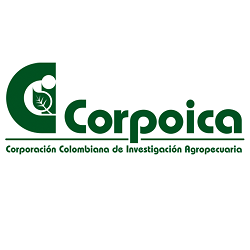 In this spirit, the Colombian Corporation for Agricultural Research (CORPOICA, from its name in Spanish) and CIAT have built a successful partnership that continues to be strengthened over time. Under a subsidiarity principle (CIAT complements but does not substitute the local national agencies), CORPOICA and CIAT have been implementing joint research in Colombia and have recently created a shared program including visits and work sessions to build trust among their growing respective staff and ensure future collaboration. It is such joint efforts and cooperation that will bring about the full potential of research in Colombia. As an increasing number of organizations in Asia undertake initiatives to address the consequences of a changing climate, our knowledge about it and how it affects agriculture in various countries has become vast. But the challenge – especially for decision makers in governments, businesses, and development institutions – is how to sift through this information and ensure that their plans are based on scientific evidence that is relevant to them. The Climate Policy Hub addresses this by generating robust evidence for countries across Asia, to assist in policy development and investment decisions related to climate change adaptation and mitigation. The suite of services offered includes agro-ecosystem diagnoses, mapping and modeling exercises, and economic and policy analyses, to help put in place the most effective and cost-efficient actions. 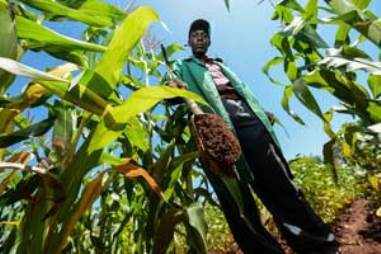 A new study shows that adding tiny, ‘micro’ amounts of certain nutrients to the soil could boost crop yields in Africa by up to 25 percent. Plants need macronutrients – such as nitrogen, potassium, and phosphorous, often added in large amounts to soil in the form of fertilizer – to grow properly. Macronutrients can already almost double maize yields in Africa, according to the literature studied. But what new research shows is that, by adding micronutrients as well – nutrients needed in micro-quantities such as iron or zinc – yields could go up an extra 25 percent on top of that. Crops are becoming less able to absorb vital nutrients to grow, due to soil erosion or degradation – so adding blends of micro and macronutrients is one way to restore the balance. Now more research is needed to find out how, and where, the right nutrients can be applied to increase yields. 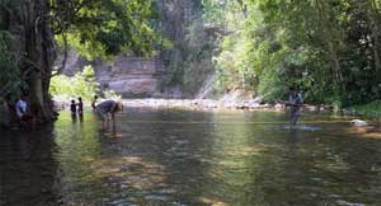 Honduras is the country with one of Central America’s largest water reserves. However, most of its watersheds show information gaps about supply and demand, which hinders the efficient use of the country’s water resources. An initiative of the Secretariat of Energy, Natural Resources, Environment and Mines (MiAmbiente+) and CIAT seeks to develop cutting-edge technologies and techniques for managing water-related data that can support integrated water management. The initiative aims to inform national decision- and policy-making, such as the implementation of the Master Plan on Water, Forests and Soils, promoted by the national government, which aims to establish productive landscapes using agroforestry systems. The results of the initiative will help guide investments from municipalities, national governments, and international cooperation agencies in water conservation and improved access to potable water and irrigation systems. CIAT and the Indian Council of Agricultural Research (ICAR) signed a three-year work plan, setting in motion an expanded set of research and capacity building activities between the two organizations. ICAR is India’s top body for coordinating, guiding, and managing research and education in agriculture in the country. With 101 ICAR institutes and 71 agricultural universities, it is one of the largest national agricultural networks in the world. Under the new 2017–2020 work plan, ICAR and CIAT have agreed to expand the scope of collaboration by covering five key thematic areas: adding value to cassava; forages and livestock systems; agricultural landscapes and soil ecology; food systems and value chains; and climate change and ecosystem services. New climate-smart agriculture (CSA) profiles were published in 2017 for five Asian countries: Bangladesh, Bhutan, Nepal, Pakistan, and the Philippines, as well as three African ones: Zambia, Tanzania, and Mozambique. The profiles summarize the challenges and impacts on agriculture in each country due to the changing climate, and list CSA practices, relevant policies, and financing opportunities for scaling up the promotion and adoption of CSA interventions along specific value chains and in different agro-ecological regions. The World Bank, for example, is developing a climate-smart investment plan in Bangladesh, where the CSA technologies identified in the country profile are being modeled for impact using national-level simulated production scenarios. Besides, if we are to reach the 2 °C maximum increase target of the Paris Agreement, emissions from the agricultural sector will need to be reduced by 1 gigaton carbon dioxide equivalent per year by 2030. 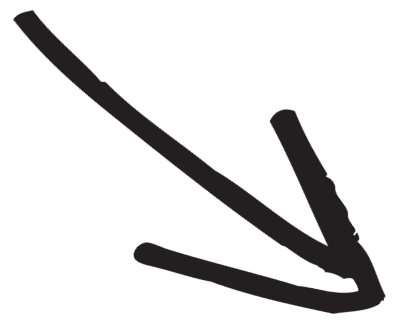 Current interventions can only achieve 21–40% of this goal. The country profiles can also facilitate the transformative change needed in the agricultural sector. 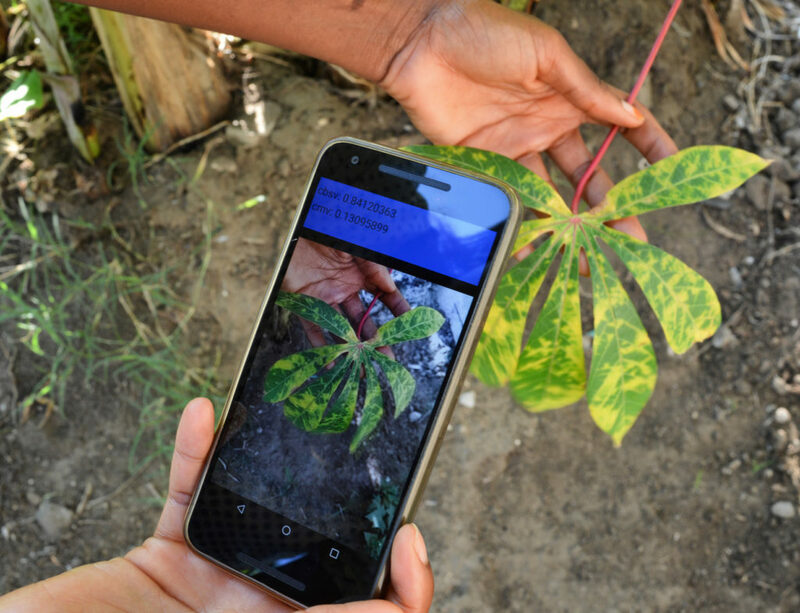 Launched in 2017, PestDisPlace is an open source application that consolidates a range of information on pests and diseases of cassava, beans, rice, and forages to help locate on-going outbreaks. The app tells where a pest or disease has been reported and uses a color coding system to show if the reported outbreak has been officially confirmed, providing genetic information whenever available. The information also allows experts and government authorities to move swiftly and efficiently to combat the outbreak. Data currently come from observations in Argentina, Peru, Colombia, Cambodia, and Vietnam that have been cleared for public release by researchers from partner institutions. In the future, scientists want to create a network of laboratories that would upload their results in near-real time in order to improve communication to public agencies and other organizations responsible for responding to pest and disease outbreaks in crops. A smartphone version of the app is also under development. New research shows that by better managing farmland soil, the amount of carbon stored in the top 30 centimeters of the soil could increase an extra 0.9 to 1.85 gigatons each year. This is equivalent to carbon globally emitted by the transport sector (1.87 gigatons); and equivalent to 3–7 billion tons of CO2, which could be removed from the atmosphere. The improved practices, among others, include, using compost or (green) manure, mulching, zero tillage, cover cropping, and other regenerative and natural climate solutions, such as agroforestry. But the question is: how can we unlock this potential. Whatever solutions we come up with for turning soils into carbon sinks, they need to be compatible with the realities of farmers. Carbon sequestration should boost farm productivity and efficiency without putting additional stress on farm resources, finances, or workloads of men and women. Paying farmers to manage their land better, or providing some kind of financial incentive will have to be an option if we are serious about meeting our climate targets. Despite its critical role, agriculture has lagged far behind other sectors in the development and implementation of digital tools. A recent report by McKinsey found that, even in industrialized economies like the United States, the agricultural sector ranks 23rd out of 25 industries in digitalization, and the rate of adoption is slow. When it comes to low and middle-income countries, it appears that these innovations have an even smaller foothold. A new roadmap outlining CIAT’s strategic vision for Africa 2017-2020 was launched in 2017. It highlights the organization’s goal in the region: To promote more productive, profitable agriculture and healthier diets at no environmental cost by providing a scientific basis for development investments and policies. “While sub-Saharan Africa is undergoing rapid transformation, with intensification of agriculture on smaller plots of land and with urbanization affecting agricultural innovation in rural areas, the shift represents great opportunities for the continent,” said CIAT Director for Africa, Dr. Debisi Araba. 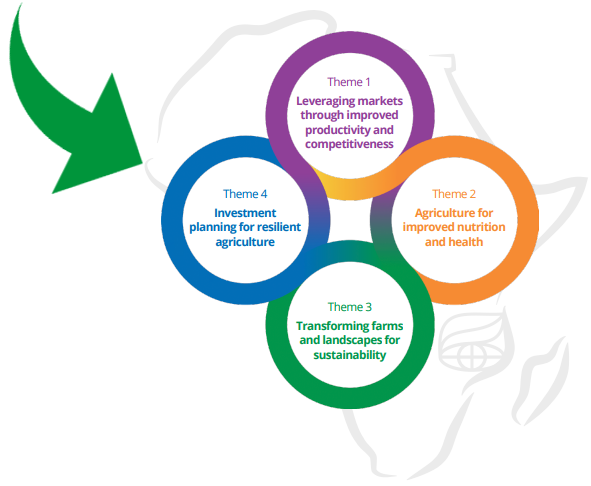 The roadmap builds on four themes to drive agricultural progress in Africa. To run successful and profitable agricultural businesses, smallholder farmers need improved crop varieties, good quality and affordable seed, organized channels to sell their produce, and access to market information, among many other things. Yet too often, they find themselves trapped in a vicious cycle: low quality seed and inadequate agricultural practices leading to low productivity. 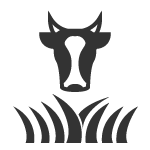 CIAT has the world’s largest collection of common bean and tropical livestock grass seeds. By protecting and improving this collection, our research aims to both improve seeds, and get them to more farmers, especially by partnering with the private sector and agribusiness for example. Africa is the only continent in the world where poverty and malnutrition are on the rise. Agriculture is a source of nutritious food and income, enabling families, especially women, to afford diverse foods and services, such as better healthcare. Families can also build more resilient, healthy families by diversifying the food they grow on their farm. CIAT will generate evidence and support investment in nutritious diets, including ways to track malnutrition before it becomes a crisis, putting in place a firm plan to help families put more nutritious food on the table. Climate change and variability put crop productivity at risk, and make pest and disease outbreaks more likely to increase. Small-scale farmers in Africa are particularly vulnerable, and need help to make their farms more resilient. We will generate and share robust evidence of the risks associated with climate change – and importantly, the opportunities to address these – especially by generating evidence and options to guide investments in climate resilience. About two-thirds of Africa’s land is degraded, while three percent of the gross domestic product is lost annually from soil and nutrient depletion from farmland. Strategies are needed to increase agricultural production without putting more pressure on our natural resources: soils, land, water – at no expense to farmers’ livelihoods – especially the livelihoods of women. Our research aims to make farms and whole landscapes more resilient and sustainable, providing information about how to improve soil, water, and natural resource management, while building up data and the information base to address landscape damage at a bigger scale. The armed conflict in Colombia, which lasted more than 50 years, gave rise to nearly 6.9 million internally displaced people, 87 percent of whom came from the countryside. At the end of 2016, the Colombian government, led by President Juan Manuel Santos, and the Revolutionary Armed Forces of Colombia – People’s Army (FARC-EP, its Spanish acronym) signed a historical peace deal. The final agreement includes a comprehensive rural reform as one of its thematic axes. Once Colombia achieves lasting peace, its annual economic growth rate is expected to rise by 1.1 to 1.9 percent. 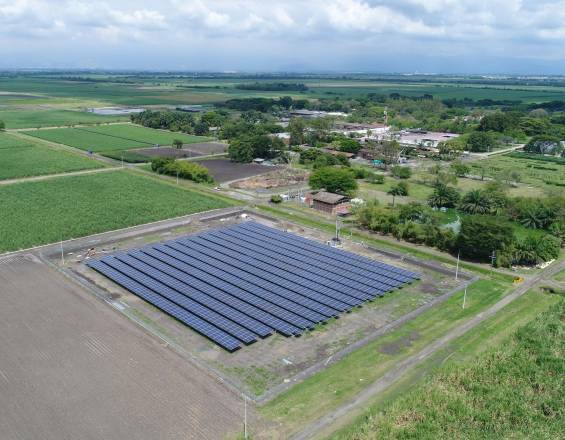 With the aim of reducing its environmental footprint and operational costs, CIAT launched in 2017 a solar power park for self-generation of energy, which will supply 20% of its total energy consumption in its headquarters. A total of 2,820 photovoltaic panels were installed in a 14,400 m2 area, with a capacity to generate 902.4 kilowatts, which will allow to cut energy costs by 12%, a saving equivalent to COP$46 million per year (nearly US$15,000). The photovoltaic cells are made of first- and second-generation materials, which make it possible for the system to tolerate high temperatures and cloudy conditions. The solar system will reduce CO2 emissions by 496 tons per year, the equivalent of planting 1,774 mature trees. “The inauguration of this long-awaited project gives us a great opportunity to promote sustainability in the use of energy in our own home. We hope to expand the initiative in the future and thus to be able to cover a greater part of our growing energy needs,” said CIAT Director General, Ruben Echeverría. As the interconnectedness between food security and environmental sustainability increases, CIAT is committed to strengthening its ability to better predict future trends and relevant responses, and especially to track and demonstrate results. Both are key to inform strategic programming and investment, and this is why in 2017 CIAT engaged further in foresight analysis and impact assessment. Complementing those investments, and building on established monitoring methods, tools and experiences in CGIAR, the Monitoring and Evaluation (M&E) Team at CIAT worked with the different programs to explicitly outline their theory of change as a way to understand and discuss the relationship between the intended impact, the research we produce with our partners, and its results. A simple and user-friendly programmatic reporting and knowledge management tool called CIAT-MARLO (Managing Agricultural Research for Learning and Outcomes) will help gather and integrate the information. MARLO will provide the basis for better program management and be instrumental in strengthening the inherent culture of learning within the Center, to reflect, talk about successes and failures, document lessons learned, and enable us to adjust plans so that we continuously improve the quality of CIAT’s programs and its performance. Everything that we discover, generate, create, or produce using our intellect at CIAT or that is sponsored by CIAT as part of research, development, training, or dissemination activities is called intellectual assets. Reflecting on it, our intellectual assets are what bread rolls and cakes are to a bakery – they are the very core of our organization. 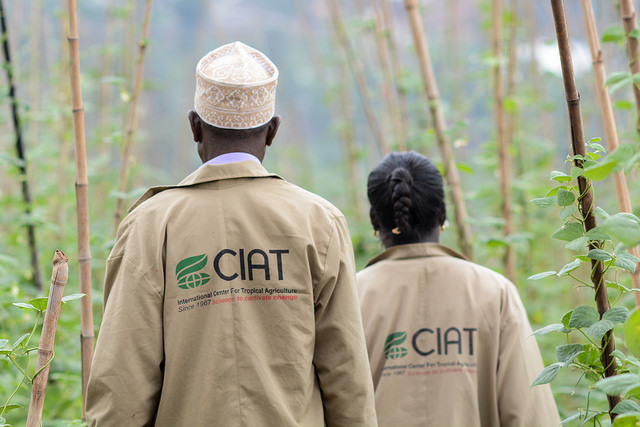 CIAT is structured to generate intellectual assets that, if properly managed, can help meet our goal of enabling farmers to enhance eco-efficiency in agriculture and contributing to building a sustainable food future. The key is then how to properly manage our intellectual assets to achieve our goals. A crucial element in all of our endeavors is partners, and the outputs and ultimately outcomes that CIAT can attain through working with them. If we consider and define early on in our collaborative undertakings the types of assets and the terms that will apply to the use of those assets that we and our prospective partners will contribute, as well as the terms that will apply to the use of the resulting goods, during the life of a project and after it ends, we would be establishing the foundations for an impact pathway. Our success rate on achieving positive outcomes and, in the end, the desired impact will depend on how well we establish the “give and take” norms that take place in a collaborative undertaking and on their ability to contribute to the people we seek to benefit. Intellectual property is the tool we use at CIAT to frame the norms for managing the intellectual assets in our collaborative work. In following and adapting CGIAR policies and principles, in 2017 and 2018 we have devised and put into operation internal policies and roadmaps that guide aspects such us benchmark terms to engage with the private sector in R&D and dissemination (R&D2) efforts and how to disseminate our information products, taking into account aspects such as authorship. Working closely with, for instance, CIAT’s Grants Office, we make sure that our plans for the management of intellectual property in the submitted proposals are according to donors’ expectations and our organization’s values. Teaming up with the Project Management Office, we evaluate the terms proposed by donors and agreements with project-related partners and amend as necessary in a way that CIAT may generate the expected results, keep doing R&D building on the deliverables achieved, and be able to disseminate them to generate the envisioned benefits. We do the same when researchers come to us asking for a draft of specific agreements for particular purposes. 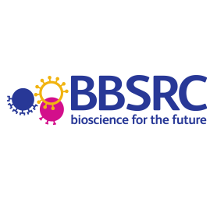 We also assist researchers in the project implementation process. Intellectual property management is a constant throughout a project life cycle, and it continues when the project ends or transforms into another one. In the future, we see dissemination and adoption of intellectual property management tools through the entire organization as a crucial activity, in a way that researchers embrace such tools and put them in operation in their R&D2 endeavors for the ultimate benefit of farmers in the tropics. In 2017, CIAT celebrated 50 years of agricultural research and development impact. Throughout 2017, the Center acknowledged the amazing people behind its achievements, its hundreds of partners around the world, and its donors, without which none of this would be possible. But CIAT also looked forward at emerging challenges and opportunities. Particularly, during the #CIAT50 celebrations held around the world, we took note of the excellent comments and suggestions made by our staff, partners and collaborators. This has motivated us to begin to chart novel research-for-development pathways forward, and reaffirmed our commitment to feed the planet, and offer a better deal for both farmers and consumers. These Altimetric donuts provide colorful visualization of the type and level of attention received by publications online. 2017 marked a significant milestone for CIAT as the Center celebrated its 50th anniversary. Special events were held in Hanoi, Nairobi, Managua, and Cali to commemorate five decades of collaborative agricultural research for development, together with our numerous partners and donors around the world. Colombia, CIAT’s primary host country, made noteworthy contributions to the Center. President Santos attended the celebrations in Cali and reiterated Colombia’s commitment to support CIAT’s new genetic resources center Future Seeds with a disbursement of 10 billion pesos, equivalent to approximately US$3 million. Colombian foundation Mario Santo Domingo committed US$500,000 to Future Seeds too, trailblazing for a budding philanthropic sector in the country. President Santos also awarded CIAT with the National Order for Merit in the degree of Silver Cross, the highest recognition an international organization can receive in Colombia. An updated assessment of CIAT’s collaborative impact revealed that the total economic benefits generated mostly by the adoption of improved crop varieties stood at a remarkable US$40 billion over 50 years. To help guide both its strategic programming and investment, CIAT is committed to providing more evidence of its impact in other areas, namely natural resource management, food systems, and policy incidence. 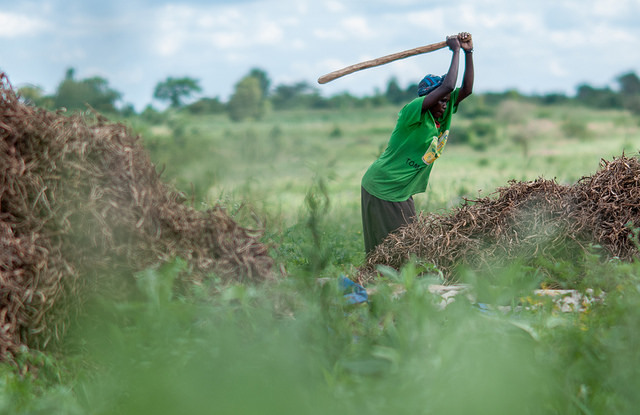 In December, HarvestPlus was awarded a US$15-million grant from the MacArthur Foundation’s 100&Change challenge for its work on one of the world’s greatest problems: hidden hunger. 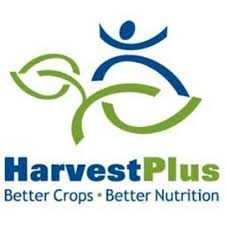 HarvestPlus will use the grant to scale up its operations and the delivery of biofortified seeds, ensuring that more communities will forever have access to crops that are more nutritious, resilient, and high yielding. CIAT’s total revenues in 2017 reached US$84.5 million against US$94.5 million in 2016, a reduction equivalent to 11% explained by a decrease of 27% in Windows 1 & 2 (CGIAR) and 8% in Window 3 funding, and an increase of 15% in bilateral funding. Despite the total revenue decrease, the daily rate of expenditure (burn rate) remains almost at the same level as of the end of 2016 (193 in 2017 vs 192 in 2016). This is in part explained by the fact that the CGIAR collaboration costs, which are excluded from the computation of the daily cost, suffered the largest reduction, 40% compared to 2016. In terms of adequacy of reserves, CIAT ended the year with 123 days of reserves which represents a loss of 9 days compared to 2016 but remains above the CGIAR recommended minimum of 75–90 days. As CGIAR funding via Windows 1 and 2 remains uncertain, CIAT has successfully been seeking alternative sources through bilateral agreements. CIAT has strong organizational, scientific, and financial foundations upon which to pursue new research directions and partnerships over the next decade. Building on fifty years of experience, CIAT will remain committed to producing independent scientific research that policy makers and farmers can use to boost the productivity, competitiveness, and sustainability of farming. In short, the Center will continue to demonstrate the enormous potential of its science in helping achieve a sustainable food future for all. Over the past fifty years, the developing world has witnessed marked improvements and innovations in agricultural production, underpinned by rigorous, independent scientific research. At CIAT, we are proud to have been a part of these advancements. When CIAT was created in 1967, the outlook for food production in developing countries was gravely concerning. According to the FAO report, The State of Food and Agriculture 1967, global production the year prior had only increased by 1% and, in the case of Latin America and Africa, it actually decreased. Food exports decreased by 2% and imports grew by 4%. The population growth rate continued to increase at breakneck speed, particularly in the poorest regions of the world. There were, at the time, only 3.5 billion people on the planet to feed. Five decades later, the global population has more than doubled, food production in the developing world is markedly heterogeneous, and we are confronting intractable problems including climate change, environmental degradation, and social dislocation due to raging wars and political instability in various parts of the planet. This has required a shift from a strict focus on research that aims to improve agricultural production, to one that is more holistic and explores entire food systems, from inputs to food waste, to landscape restoration, climate change mitigation and adaptation, biodiversity conservation, and policy and governance issues. 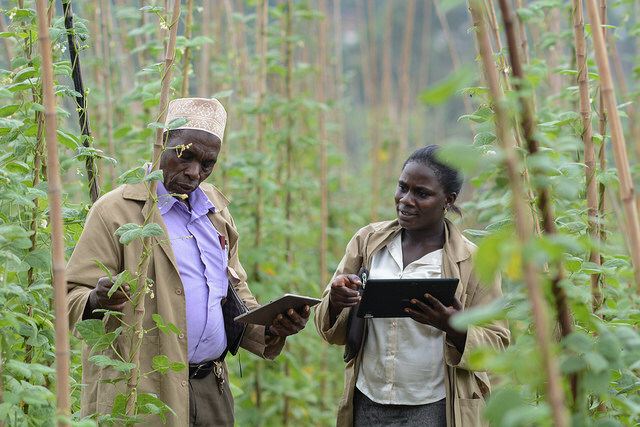 For example, we are among the first CGIAR research centers to have adopted the use of big data analytics, acknowledging its huge potential to serve farmers – from providing climate and agricultural forecasts so they can make better farming decisions, to screening for genetic traits of plants for efficient breeding of crops with desirable qualities. Our efforts have borne fruit. We helped save Latin American rice farmers from millions of dollars in losses by providing them, with support from our partners, with timely information regarding if and when to plant. For that, our scientists working on big data for climate change adaptation won the prestigious 2017 Momentum for Change Lighthouse Activities from the United Nations Framework Convention on Climate Change. We also lead, together with the International Food Policy Research Institute (IFPRI), the CGIAR Platform for Big Data in Agriculture. During the platform’s first annual convention, hosted by CIAT, our halls were brimming with excitement. Scientists from across the CGIAR System huddled with innovators from the private sector to discuss and develop ideas on democratizing and harnessing decades of data so the agricultural sector can produce more to meet the demands of the world’s ever-growing population, and do so in a sustainable manner. And we are going beyond that. By the end of 2018, CIAT and its partners aim to launch an early warning system that can help, along with new technologies, policies and governance structures, put an end to malnutrition in Africa in our lifetime. The Nutrition Early Warning System (NEWS) will use big data and artificial intelligence to provide forecasts so that Africa will never again experience a famine like the one it had in 2017, which the United Nations described as the worst humanitarian crisis since 1945. CIAT is also trailblazing in novel areas, including pursuing research that explores the challenges and opportunities to build peace and produce food without having to cut down more trees, a goal that Colombia has set as part of its post-conflict and climate change mitigation efforts. We are developing and testing approaches along this line that we believe can be applied to the more than 20 developing countries that are engaged in or emerging from war, and have priorities relating to peacebuilding, reducing greenhouse gas emissions, and feeding their populations. 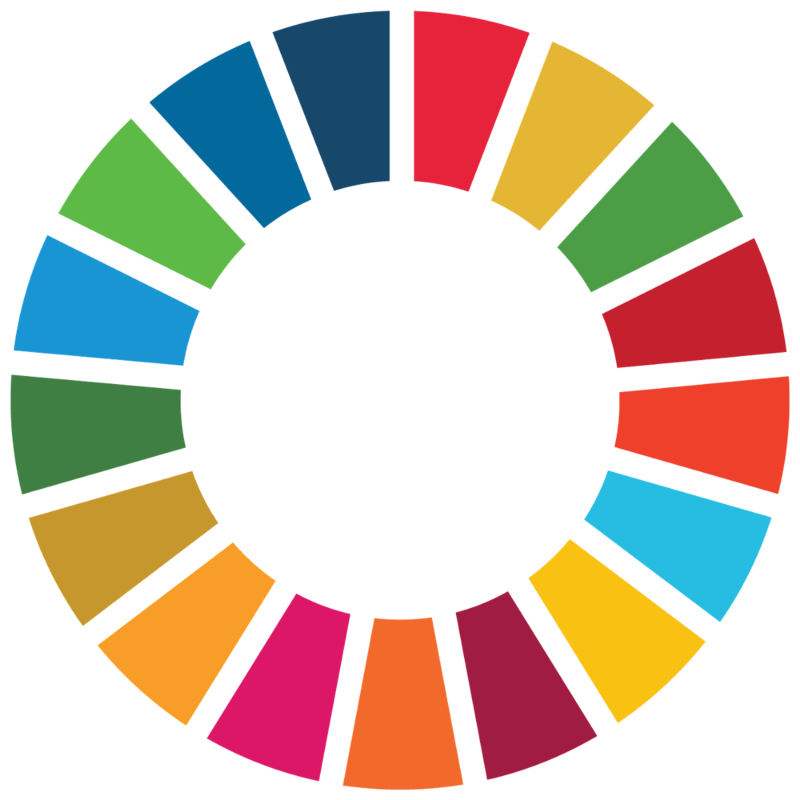 We are also developing approaches to make the food system – the gamut of activities starting from processes that precede the planting of a crop through to final consumption of the resulting food and food waste management – sustainable, in line with our commitment to helping the world meet the United Nations’ Sustainable Development Goals. This exciting line of work contributes to ongoing efforts to develop food systems that can generate opportunities for low-income women and men in the food system, that are resilient to market and weather shocks, and that incentivize improved land, energy, and water use and increased access to food for better nutrition. 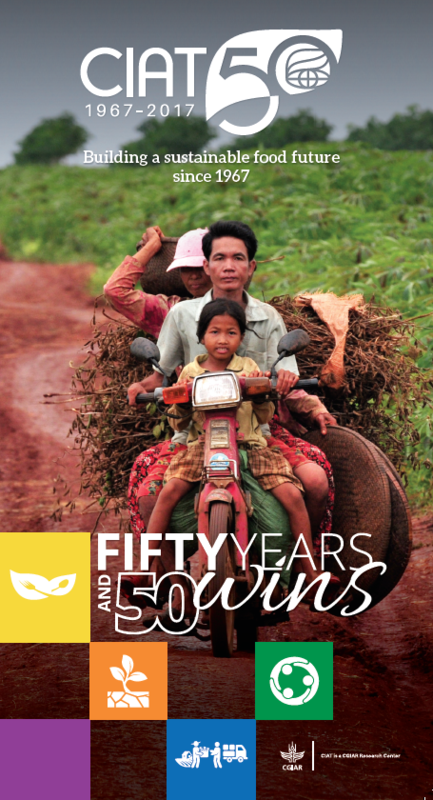 CIAT now looks ahead into the next 50 years, inspired by our past achievements and driven by the agricultural and development needs of the countries we work with. We are deeply appreciative of the steadfast support we have received from our partners and supporters over the past five decades and look forward to continuing to build a sustainable food future for all. In 2017, South Sudan fell victim to the first famine declared since 2011. Almost six million people are still at risk of starvation. Over one million displaced Sudanese have migrated to neighboring Northern Uganda, where they stay in camps for displaced people fleeing conflict. Yet, resources to feed the influx of people fleeing South Sudan are scarce. The World Food Programme reported that it had been forced to cut food rations due to funding delays. A long-term food security solution for the region is urgently needed. In the Gulu district of Northern Uganda, communities have slowly returned after fleeing the Lord’s Resistance Army rebel group three decades ago. Despite little farming experience, technology, and resources, they now have a major task on their hands: supplying food for their own families and communities, and now, also supporting refugees escaping war in hunger-stricken South Sudan. 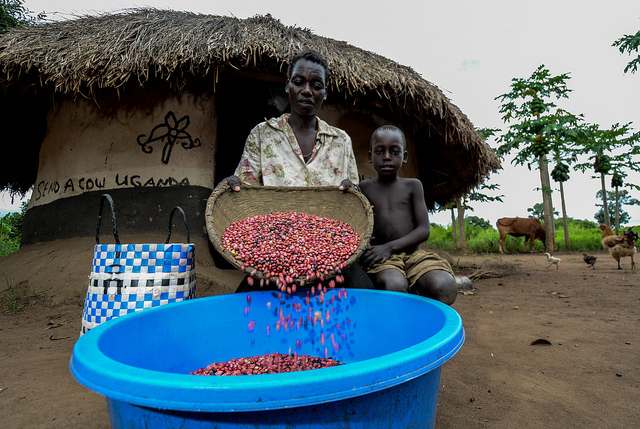 Together with Uganda’s National Agricultural Research Organisation (NARO), CIAT and partners have been working together to supply farmers with high-yielding, drought- and disease-resilient NABE15 beans, to boost production and improve nutrition among vulnerable communities and refugees in Northern Uganda. Despite persistent drought, farmers have increased their bean yields for their families to eat and sell to traders. Experts say the “super” NABE15 beans are valuable because they cook quickly and tolerate most diseases and pests. 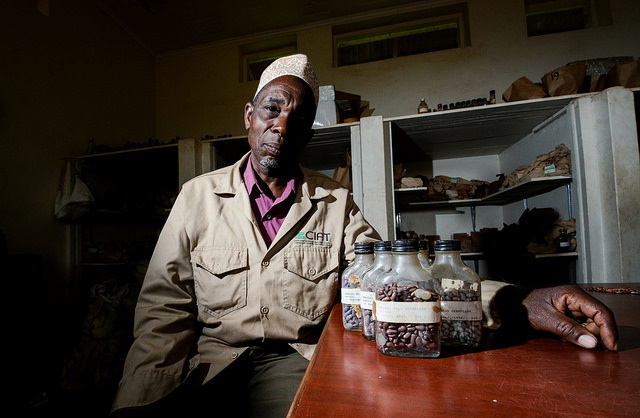 “It is also a shiny red color, which local consumers like,” said Dr. Robin Buruchara, director of the Pan-Africa Bean Research Alliance, which preserves the beans in its genebank at Kawanda – Africa’s largest genebank for beans. Relief agencies of the United Nations, including the Food and Agriculture Organization (FAO), and other NGOs have bought the resilient seeds from private sector companies to provide to communities in refugee camps along the border with South Sudan, where hunger levels are critical. Aid workers hope the beans will encourage the refugees to grow their own food rather than rely on handouts. “It is important that other sources of food be found to complement the food assistance,” said Beatrice Okello, senior program manager at FAO in Uganda, saying that just 50 kilograms of planting seeds are expected to yield up to 2,000 kilograms of beans. The improved bean varieties came from PABRA’s Kawanda genebank in Uganda, which protects and stores around 4,000 varieties of beans. A number of these were sourced from CIAT’s genebank in Colombia – which houses the largest collection of common beans in the world. Led by a pioneering team of African breeders, this storage facility is a refuge for a series of resilient beans sent to countries across Africa, to boost local supplies of improved, hardy bean seeds, and alleviate reliance on food imports. For example, in 2017, Ethiopia, Tanzania, Rwanda, and Burundi received different types of heat- and drought-tolerant beans. 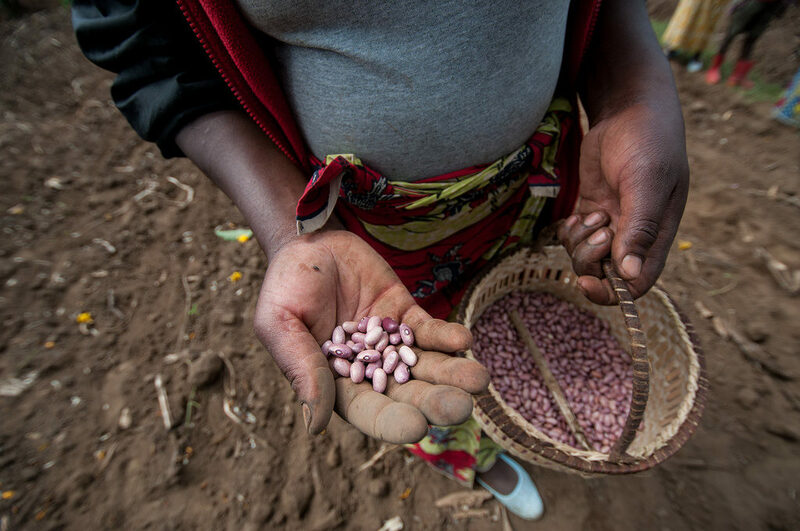 Four micronutrient-rich bean varieties – high in iron and zinc to tackle malnutrition – were released in Kenya and five were released in Uganda in 2016. Researchers are exploring sending more climbing beans for Rwanda and parts of Uganda – where they help farmers on smaller plots of land increase their production. Yet, this refuge for seeds could be under threat, with dwindling funding and fewer resources to support vulnerable national research programs – for example, those in South Sudan. Bean researchers are under more pressure than ever to beat increasing weather extremes: such as drought and flooding – also with fewer resources and less capacity. This could critically affect the supply of nutritious beans, an affordable, major staple and source of protein for many countries across Africa. Chronic or non-communicable diseases are the leading causes of mortality around the globe. Take a look at these staggering figures from the World Health Organization: of the 56 million deaths in 2015, 40 million or 70 percent were caused by heart disease, stroke, cancer, chronic respiratory diseases, and diabetes. Most of those illnesses can be prevented. One way to do so is through more nutritious, diverse diets. That’s where genebanks can help. “[We] should start thinking about … biodiversifying our diets. 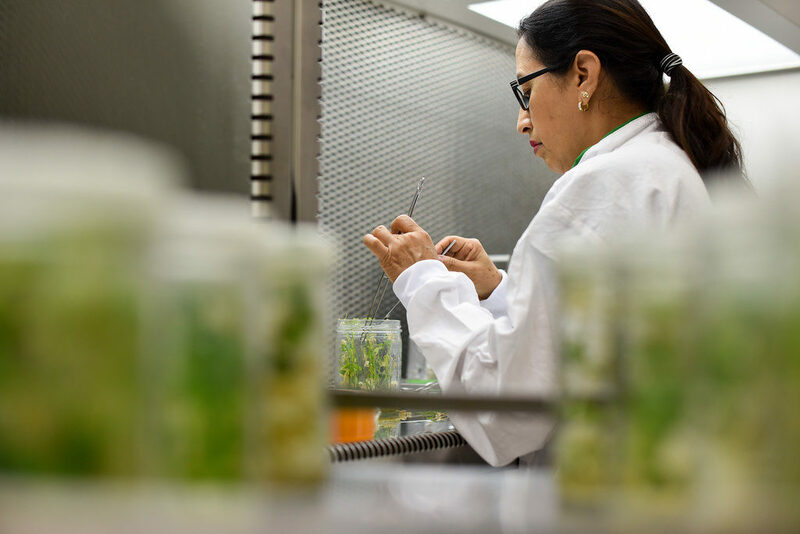 We have the tools … it’s the genetic diversity that’s being conserved in our genebanks,” said Peter Wenzl, Leader of Genetic Resources at CIAT, during the #CIAT50 celebrations at the Center’s headquarters in Cali, Colombia. CIAT is seeking to build a state-of-the-art genebank that not only conserves crops and their diversity, but also harnesses this diversity to improve diets, reduce the impact of farming on the environment, and enable agriculture to adapt to climate change. Traditional genebank. Future Seeds will continue the work that CIAT is doing to conserve crops in accordance to international standards. Digital genebank. It will serve as a platform for collaboration and knowledge sharing among genebanks in Latin America, particularly on genomics. Another goal is to use big data and other innovative technologies to identify traits of plants based on their genetic characteristics. Education. It will partner with universities in the region and elsewhere to breed a cadre of scientists who are well-versed in genomics. It will also build public awareness among visitors about the importance of crop diversity in agriculture to secure the future of the planet. 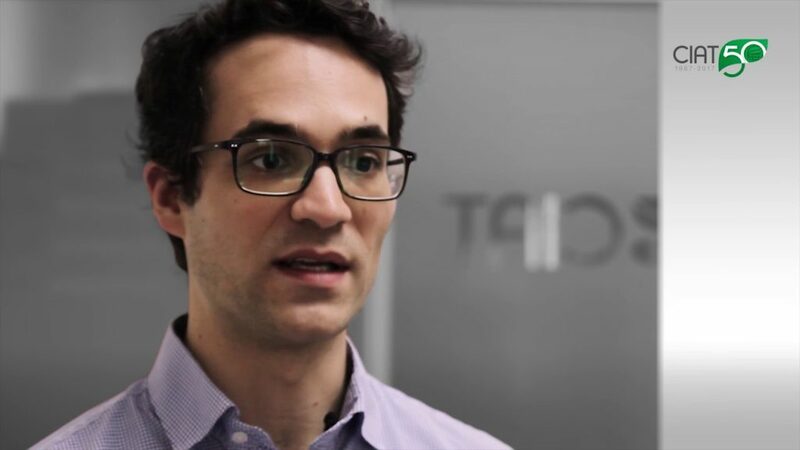 “I think [Future Seeds] is a strategic investment: It’s a strategic idea to be implemented in a strategic location at a very critical time,” said Wenzl, alluding to Colombia, which is among the most biodiverse countries in the world. During the #CIAT50 celebrations, Colombian President Juan Manuel Santos committed US$3.3 million toward Future Seeds. The UK Government has also pledged its support toward the initiative. 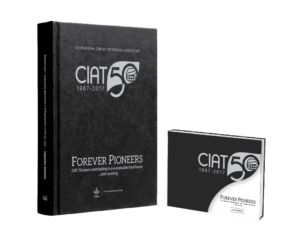 Over the course of 50 years, CIAT has been a leader in the development and dissemination of agricultural technologies (including improved crop varieties), pioneering approaches, and new knowledge in the tropics. The impacts of this work do not come solely from CIAT’s research but are the result of joint efforts with multiple partners and stakeholders who, for instance, adapted and disseminated locally a specific technology. CIAT’s Impact Assessment team has devoted considerable effort to measuring the economic impact of CIAT’s collaborative agricultural research for development, reviewing more than 300 publications and surveying over 17,000 farming households. Most impacts documented so far are related to commodity research on CIAT’s four mandate crops: common beans, cassava, rice, and tropical forages. The brief “The impacts of CIAT’s Collaborative Research” published on the occasion of CIAT’s 50th Anniversary in late 2017 reveals that US$1.8 billion invested by CIAT in bean, cassava, rice and forage research has contributed to generate US$39 billion in economic benefits globally. In the case of common beans, the Impact Assessment team found that CIAT has invested a total of US$668.8 million globally over 50 years. Simultaneously, CIAT partners have further invested US$3.9 billion in Latin America and US$0.8 billion in sub-Saharan Africa over the same period, to validate and disseminate new bean varieties, among other actions. This combined investment has generated a cumulative return of US$17.4 billion, or US$3.22 for each dollar invested. 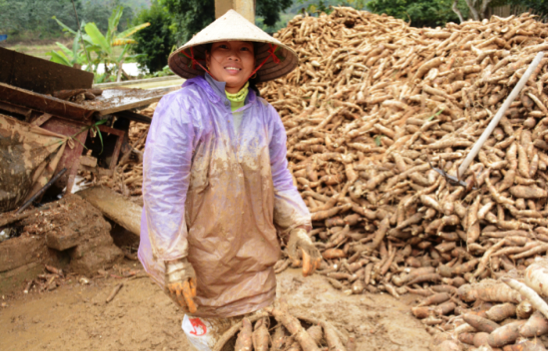 As for cassava, the biggest impact is evidenced in Southeast Asia, where 66% of cassava fields in the region are planted to CIAT-related varieties. While CIAT has invested a total US$378.4 million in cassava research globally since the 1970s, its partners have further invested some US$3.7 billion in Latin America and the Caribbean and in Southeast Asia during the same period. This combined investment by CIAT and its partners has resulted in a cumulative return of US$9.2 billion, or US$2.28 for each dollar invested globally – and up to US$5.27 for each dollar invested in Southeast Asia. After decades and impact assessment efforts undertaken, our estimates show that 89 percent of CIAT’s total investment has been devoted to commodity research. Over the years, the methodologies for measuring the outcomes and impacts of genetic crop improvement and crop management practices have also improved substantially. But as new challenges arose – and especially concerns about the sustainability of food production – CIAT has been concerned with nearly every aspect of tropical agriculture: the crop varieties that farmers grow, but also the production systems they manage, the agricultural landscapes they inhabit, the markets in which they participate, and the policies that influence their options and decisions. Over the last 20 years, other research areas have become priorities too for CIAT, including genetic resource conservation, natural resource management, development of inclusive business models, and policy incidence. This research is starting to show evidence of change but, while this presents an opportunity to document CIAT’s impact beyond commodity crops, precise assessment of such impact poses a number of challenges. Establishing a clear cause and effect between CIAT’s research and the impacts observed is not always straightforward. Moreover, many initiatives are still in their early stages and might need more time to exhibit observable changes. Impacts also often depend on factors that are beyond the control of CIAT and its partners, and measuring the specific effects of CIAT’s research might require further methodological developments. CIAT’s impact assessment research acknowledges the importance of strategic partnerships to improve assessment methods and procedures. In order to continuously strengthen its capacity to effectively document its outcomes and impacts, CIAT is working with other CGIAR Centers, HarvestPlus, the Pan-Africa Bean Research Alliance (PABRA), universities, advanced research institutes, and a network of national partners. It would be extremely difficult – if not impossible – for an international organization such as CIAT to document all of its impacts since its inception 50 years ago. Nevertheless, impact assessment is a necessary exercise, both in the interest of accountability to donors and other stakeholders, as well as to inform strategic decisions and investments in the future. Innovation has always been part of CIAT’s DNA. 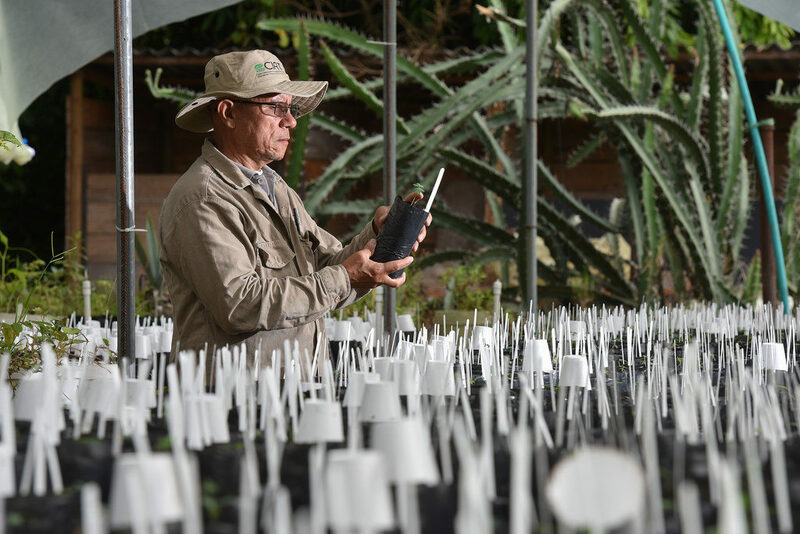 Since its birth in 1967, CIAT has utilized novel tools to breed and improve some of the most important crops in Africa, Asia, and Latin America. Genome editing is one such tool. It uses CRISPR-Cas, a revolutionary technology that can “cut” genes in living organisms, prompting cells to repair the damage. But, when doing so, it will insert or delete portions of its DNA, resulting – in the case of crops that CIAT is working on: cassava, beans and rice – with new or better traits. At CIAT, research on genome editing started in 2015. In June of that year, researchers Masaki Endo and Seiki Toki of the Japanese National Institute of Agrobiological Sciences (NIAS) brought CRISPR-Cas to CIAT headquarters in Colombia and tested it on rice plants. By December, CIAT – and the whole CGIAR system for that matter – had its first genome-edited crop: rice plants that had “droopy” instead of upright leaves. 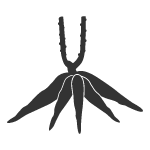 Changing the shape of the plant’s leaves was just a way to prove the feasibility of using the tool. Today, CIAT remains the only institute in Latin America to have expertise in genome editing for agricultural crops. CIAT is using the technology to validate a candidate gene for resistance to rice hoja blanca disease. The disease, which is prevalent in Latin America, bleaches the leaves of rice plants and eventually kills them. It allowed CIAT to discover novel starch quality traits in cassava such as the waxy starch, which promises to strengthen the crop’s appeal to industrial markets. CIAT is also using genome editing to make it easier for people to digest beans, as many people get stomachaches from consuming them due to naturally occurring compounds such as polysaccharides. “[Genome editing is] probably one of the most promising technologies right now in agriculture,” said CIAT’s Agrobiodiversity Research Area Director Joe Tohme during the #CIAT50 anniversary celebrations at the center’s headquarters in Cali, Colombia, in November 2017. CIAT is partnering with organizations in the academic, corporate, public, and research sectors to accelerate plant breeding using genome editing, as well as to develop a strategy to build awareness about the genome technology and its objectives for food security and nutrition. Climate change is a serious concern for companies that market chocolate and coffee. CIAT research has revealed that an expected annual temperature rise of more than two degrees Celsius by 2050 will reduce the suitability of certain areas to produce cocoa and coffee and sometimes leave them unsuitable. But while climate change will radically affect cocoa and coffee farming in several regions of the world, actions can be taken now. A consortium involving CIAT, the International Institute of Tropical Agriculture (IITA), the Rainforest Alliance, Root Capital, and the Sustainable Food Lab is gaining ground to ensure that Ghana’s most important crop — cocoa — survives, thrives, and even contributes to reducing greenhouse gas emissions. Climate change, according to projections, is expected to dramatically alter the landscape of cocoa farming in the West African country — currently one of the world’s largest producers of the crop. Regions that produce a significant share of cocoa today, such as Sunyani in the west of the country, are likely to become unsuitable for cocoa production by 2050 as a result of rising temperatures and changing rainfall patterns. 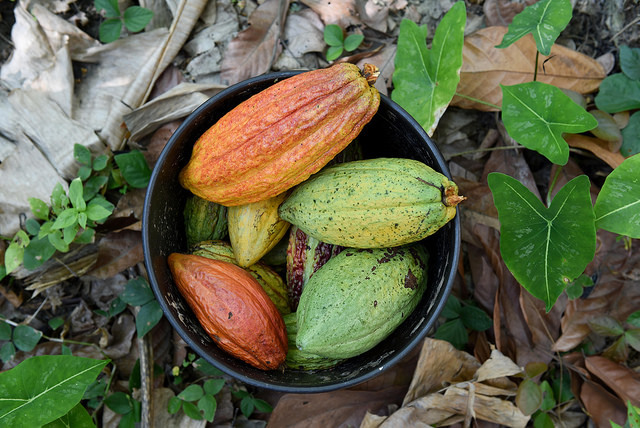 A proactive stance is particularly important for climate-sensitive crops such as cocoa, which hundreds of thousands of smallholder farmers in the country depend on as their main source of income. “People […] don’t consider that even if we had heat- and drought-tolerant cocoa varieties available today, and a system to distribute them to farmers, it would take more than 20 years to replace existing plantations. But we don’t have these varieties, and we don’t have such a system. For that reason, it’s vital to look at climate-smart agricultural (CSA) practices that can be implemented quickly and effectively,” said Christian Bunn, a postdoctoral fellow at CIAT. Under the CGIAR Research Program on Climate Change, Agriculture and Food Security (CCAFS), which CIAT leads, experts produced different packages of climate-smart practices depending on the needs of particular farms. Some farms would need to plant more trees to provide necessary shade for cocoa plants, while others may have no other choice but to cultivate other crops. The packages are part of the training that Rainforest Alliance will provide to cocoa farmers going forward. In addition, Rainforest Alliance is collaborating with the World Cocoa Foundation to develop a series of climate-smart training add-ons using CCAFS climate-smart packages. 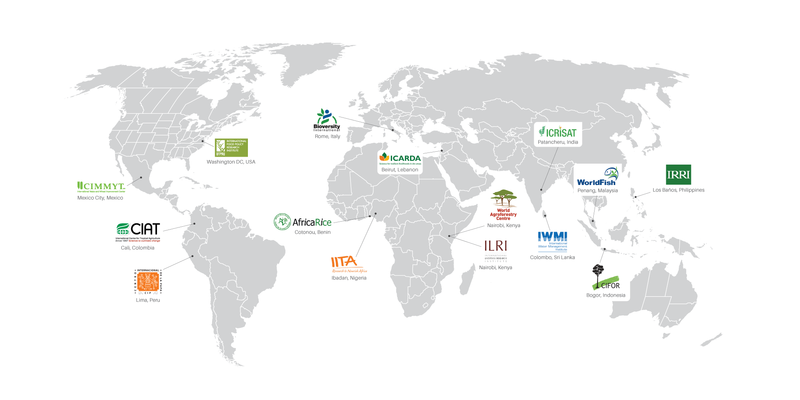 Also, following a push by Rainforest Alliance, an informal working group on climate action in agriculture focusing on CSA was created within the ISEAL Alliance, the global association of organizations that certify farms for meeting desirable environmental, social, and economic standards. The working group is a first for ISEAL in relation to climate change. This milestone means another step closer to the consortium’s goal of reaching Ghana’s 800,000 cocoa producers to prevent what could be a devastating scenario for the industry in the coming decades. 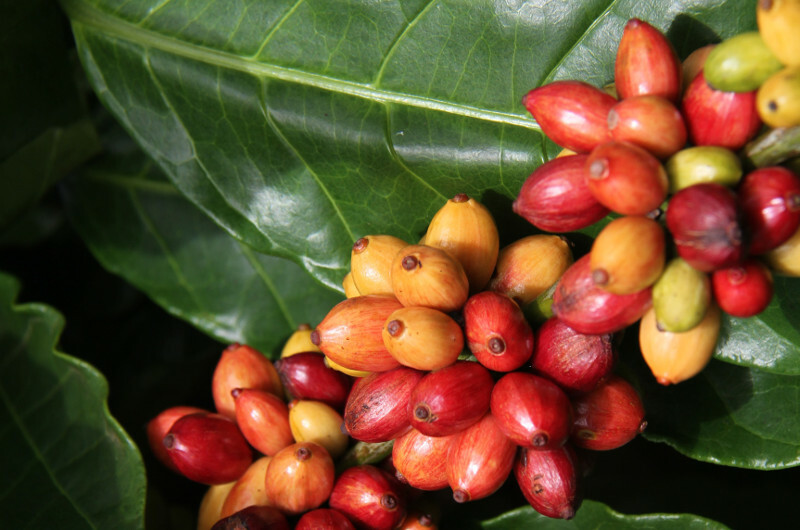 Vietnam’s coffee industry fulfills approximately 40 percent of global Robusta demand. Robusta coffee has a more bitter taste and commands a lower price than Arabica, and coffee roasters often use it as filler for other coffee products or to blend with Arabica to make a stronger espresso. In general, Vietnamese farmers use very big amounts of fertilizer and water and eliminate shade trees. That way, they can produce and sell vast amounts of coffee, hence offsetting Robusta’s lower price. Vietnam is today the world’s biggest producer of coffee per hectare, at 2.4 tons. The runner-up, Brazil, is at 1.4 tons per hectare. Excessive irrigation, overuse of fertilizer, and the lack of shade trees, however, come with a cost. According to CIAT research, coffee farms in Vietnam face the likelihood of not having enough water for irrigation and failing soil health in the future. Our projections also show that certain coffee-producing regions are becoming less suitable for coffee cultivation and that some will become totally unsuitable in 20–30 years. Add weather events such as drought – the 2015–2016 drought was described as the most prolonged in the past 90 years – and it could lead to a catastrophe for the industry. In response, stakeholders in the sector have rallied under “coffee & climate” (c&c), a global initiative founded in 2010, which brings together players from the private, development, and research sectors to address challenges posed by changing climatic conditions to the entire coffee value chain. In Vietnam, it works through the Hanns R. Neumann Stiftung, or HRNS, the foundation of one of the initiative’s founders and the world’s largest coffee trading company, Neumann Kaffee Gruppe. HRNS has been instrumental in encouraging the government, particularly the Ministry of Agriculture and Rural Development, to develop a five-year national strategy that will enable the coffee sector to adapt to and mitigate the risks of climate change. 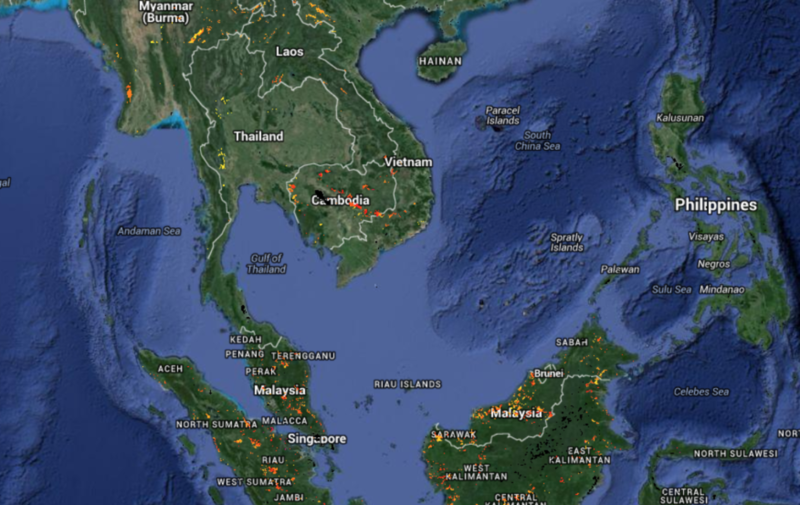 The strategy is a first for Vietnam. The strategy is currently in its final stages of development following a series of interviews with all the important industry players — farmers, input suppliers, coffee roasters, coffee breeders, traders and sustainability certifier UTZ/Rainforest Alliance – which allowed to identify threats and actions required to address them and make sure that coffee farming in Vietnam remains viable in the coming decades. Indonesia is the largest cocoa producer outside West Africa. CIAT projections of future climate suitability for cocoa predict fundamental changes: while Indonesia will still remain a largely suitable country for cocoa production, current producing regions will face steep adaptation requirements in order to maintain the areas currently cultivated. That is a “serious concern for the future,” noted Mondelez International, which owns confectionery brands Oreo, Cadbury, and Toblerone, in a position paper it released last year. In 2012, Mondelez set up Cocoa Life, whose programs expanded to Indonesia in 2013, pledging to spend US$400 million by 2022 to ensure the sustainability of cocoa production and improve the welfare of the people and their communities within and along its supply chain. By doing so, they expect to be able to meet the growing demand for chocolate. Scientists at CIAT’s Climate Policy Hub are working with Mondelez to help achieve that. They are studying the different threats that cocoa farmers face because of climate change and how these threats link to deforestation. They are exploring in particular the use of CIAT’s satellite-based tool Terra-i to monitor land cover changes in cocoa-growing areas as well as researching the types of shade trees that can capture and reduce carbon emissions. The results from those studies will guide decision on the climate-smart agriculture practices that can be prioritized in the Cocoa Life area in Lampung province, and eventually in all cocoa-producing communities. In an initiative supported by the Food and Agriculture Organization of the United Nations (FAO), the Cambodian government looked into the feasibility of adopting Terra-i as a land-change monitoring tool in the country. As the consequences of deforestation become increasingly pressing, Cambodian authorities feel the urgency to strengthen capabilities to spring from observation into on-the-ground action. So far, the government has been using satellite images at a scale of 1:250,000 (1 cm on the map equals 2.5 km2 on the ground), with data on forest cover updated every four years; whereas Terra-i can generate new imagery every 16 days for every 250 m2 of land. As a pilot, Terra-i was calibrated to work in two sites: Mondulkiri Province in the country’s southeast, and Phnom Kulen National Park in tourism-famous Siem Reap Province. It then identified the following alerts based on data from 2007 to 2017. These results are compatible with the Global Forest Change records, confirming Terra-i’s accuracy. With assistance from various programs and facilities, the Cambodian government submitted its initial forest reference level; drafted a national REDD+ strategy; and developed a national forest monitoring system, which enables the measurement and reporting of forest-related emissions to the UNFCCC (UN Framework Convention on Climate Change) and of the state of the forest to the Global Forest Resource Assessment. The open-source, near real-time monitoring system Terra-i will no doubt strengthen Cambodia’s national forest monitoring system, especially to support ground action by providing timely information to forest rangers and provincial authorities on the state of the forest, as well as on looming encroachment. To achieve this, necessary technology, skills, and institutional structures will need to be strengthened. Institutional structures that clearly identify processes and roles and responsibilities, if and when an alert for an unusual vegetation change is detected, need to be put in place. By 2050, climate change and variability could cost the Philippine economy more than US$500 million a year. Indeed, growing water and heat stress, accrued incidence of pests and diseases, and shifts in crop suitability are among the factors expected to bring crop yields down. This will make the Philippines even more dependent on imports of staple foods such as rice, coffee, vegetables, and pork. 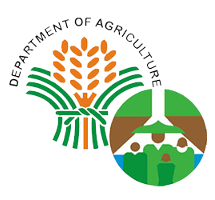 As a response to these challenges, the Philippine Department of Agriculture launched in 2013 the Adaptation and Mitigation Initiative in Agriculture (AMIA). AMIA seeks to increase resilience of climate risk-prone agricultural communities by scaling up agricultural practices that are proven to sustainably enhance productivity. The initiative is informed by a climate-smart agriculture (CSA) country profile published by CIAT and the CGIAR Research Program on Climate Change, Agriculture and Food Security (CCAFS) in 2017. The profile provides an overview of the likely impacts of climate change on agriculture in the Philippines, analyzes the country’s capacity to respond, and reviews existing climate-smart practices. The CSA profile also provides recommendations for investment priorities for each subnational region. In support of the initiative, CIAT helped perform a climate-risk vulnerability assessment for 10 out of the country’s 17 regions in order to identify which areas in each region are most at risk. The level of vulnerability is determined by a combination of a region’s exposure to climate variations, crop sensitivity to temperature and precipitation changes, and capacity to adapt to climate variability and change. “We have used the tools made available by CIAT, which is very important in identifying the most vulnerable communities and prioritizing where we put our limited government resources,” says Alicia Ilaga, then Director of the Department of Agriculture Systems-wide Climate Change Office (DA-SWCCO). Areas particularly vulnerable to climate risks have been identified in each of the ten regions. The municipality of Pontevedra in the province of Negros Occidental in Central Philippines is one such area, with high level of exposure to climate-related hazards such as flooding, rain-induced landslides, storm surges, typhoons, and drought. 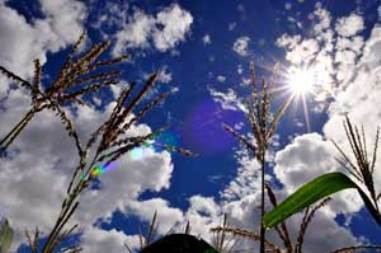 Farmers in Negros Occidental already complain of decreasing rice and maize yields – the province’s second and third most important crops, after sugarcane – despite increasing fertilizer use. This was not surprising. The Philippine CSA profile mentions that, throughout the country, intensive cultivation has resulted in land degradation characterized by erosion and nutrient depletion. According to a cost-benefit analysis of CSA practices performed by the Visayas State University and CIAT, a shift to organic farming and from direct seeding to transplanting of rice would be a worthwhile investment from an economic, social, and environmental standpoint. The practice is poised to generate nearly US$200,000 worth of incremental benefits over ten years on a 480-hectare pilot site. Some farmers in the province have been practicing organic farming to regain soil health and increase productivity. One of them is Delia Edianel, who has been cultivating organic rice and using drought-tolerant varieties for five years. While yields in her first season using organic fertilizer were dismal, she has since learned more about organic farming, and now gets more than she ever did when she was using chemical fertilizers. Through AMIA, the government envisions making available a comprehensive suite of support services, including climate information, finance and insurance, climate-resilient infrastructure and technologies and practices, to the Philippine agri-fishery sector. 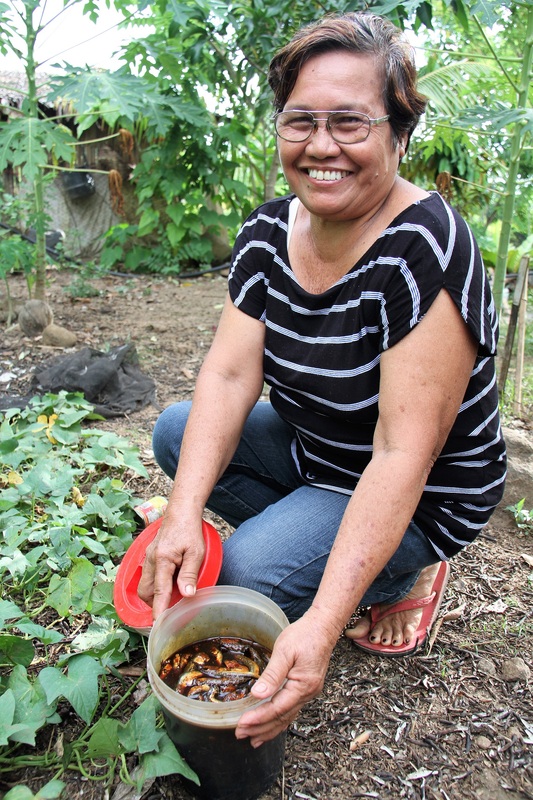 But while climate-resilient practices are already being adopted by some small-scale farmers like Delia, uptake is still low due to a variety of reasons. These include low availability of and limited access to improved seed, insufficient financial resources to cover investment costs, and weak extension services. The Regional Program for Research and Innovation in Agricultural Value Chains (PRIICA) was an initiative supported by the European Union and the Inter-American Institute for Cooperation on Agriculture (IICA), headquartered in Costa Rica. 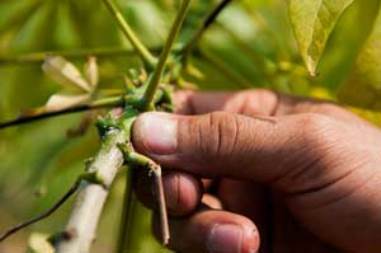 It was implemented between 2015 and 2017 through activities in six Central American countries: Costa Rica, El Salvador, Guatemala, Honduras, Nicaragua, and Panama, under the concept of crop-based regional networks for avocado, potato, tomato, and cassava. Jointly with the national agricultural research institutes, Clayuca Corporation and CIAT provided technical backstopping and support specifically to strengthen the cassava agro-productive chain in each of the countries. 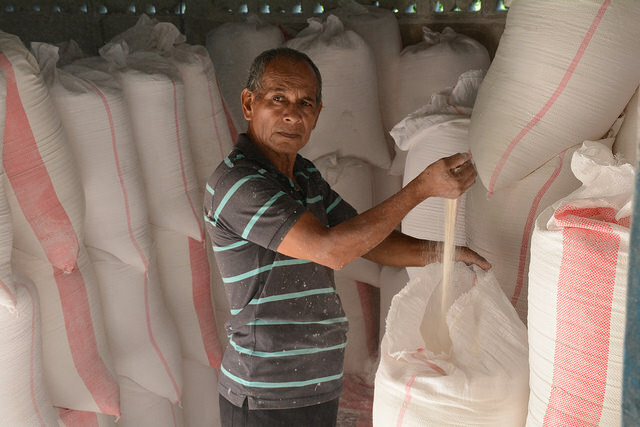 “The cassava regional network aims not only to make this tuber crop a ‘star’ food in the Central American food basket, but to take it into another component of the value chain: transformation. It also seeks to foster agro-industrial development and export markets,” said Manuel Pérez, IICA liaison in Nicaragua for the PRIICA project. Within the framework of PRIICA, 15 cassava varieties conserved in CIAT’s genebank were selected, duplicated in vitro, and distributed to the six countries in 2016. 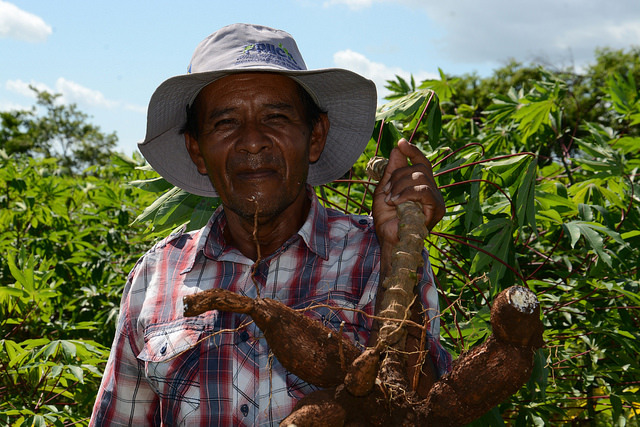 Reynaldo Mercado is one of the farmers in Masaya, in the metropolitan region of Managua in Nicaragua, who decided to bet on new cassava varieties when the Nicaraguan Institute for Agricultural Technology (INTA) proposed him to cultivate new improved varieties. Today, his farm has become a “seed bank” where he has sown varieties better adapted to the local agro-ecological conditions, namely, INTA Perla, INTA Amarilla, INTA Reyna, INTA Dorada, INTA Rama, and INTA Nicaragua. These varieties, named after INTA, arrived from CIAT to the country in 2003 and 2004. Reynaldo and 16 other farmers who make up their cooperative produce quality seeding material, which they sell to smallholder farmers in the region through their community seed bank. And cassava cultivation is generating income not only from stake production, but also from root production. Using good agronomic practices, these varieties produce yields as high as 33 tons per hectare (63% more than the traditional varieties), the dry matter content surpasses 35%, and they are resistant to pests and diseases endemic to the area. Furthermore, their root quality guarantees acceptability as raw material for cassava starch processing plants operating in the region, such as Almidones de Centroamérica (ALCASA), Nicarahuac, and Opportunity International. Reynaldo is currently experimenting with newcomer cassava varieties from CIAT and, just as with previous varieties, he anticipates a good production potential for both seeding material and industrial use. Conny Barahona is a member of the same cooperative as Reynaldo. About a year ago, she started to cultivate INTA Amarilla. Unlike other cassava varieties cultivated in the area, its flesh is not white but yellow, due to its high betacarotene content (4 ppm), which is an important precursor of vitamin A micronutrients – required in small quantities for the normal functioning of vision, growth, reproduction, and the immune system. INTA Amarilla or CM 6119-5 – its registration number upon leaving CIAT’s genebank in 2004 – through Clayuca Corporation, was especially improved and validated by INTA and made available to farmers in 2015 as a variety with high nutritional content. INTA Amarilla produces up to three times more than the “creole” varieties. With good management practices, a manzana (approximately 0.7 hectares) of INTA Amarilla can produce up to 361 quintals (or 16.4 tons), while a creole variety can produce some 154 quintals. The variety can be consumed fresh thanks to its good culinary qualities (low fiber and easy to peel off) and cooking time of 25 minutes. It also has an industrial use thanks to its 35% of dry matter. In addition, it is resistant to pests and diseases. 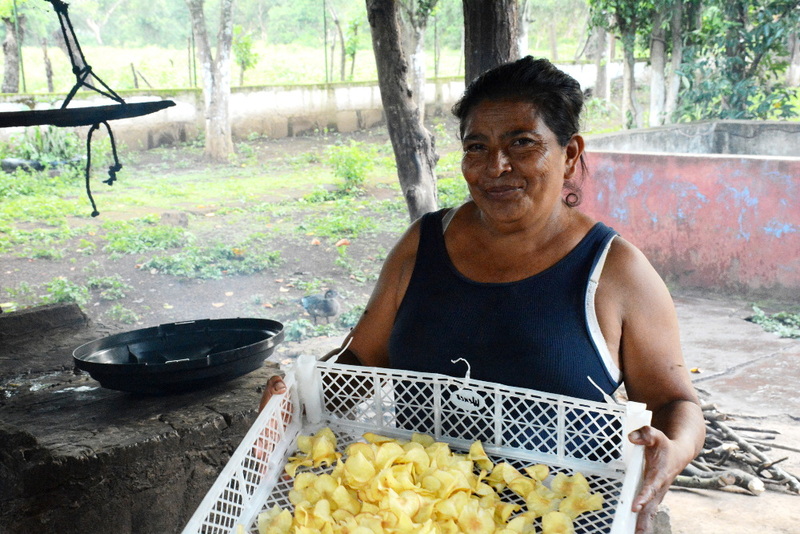 Through training classes organized by INTA, Conny learned to add value to her produce by making cassava chips. And this really adds value. 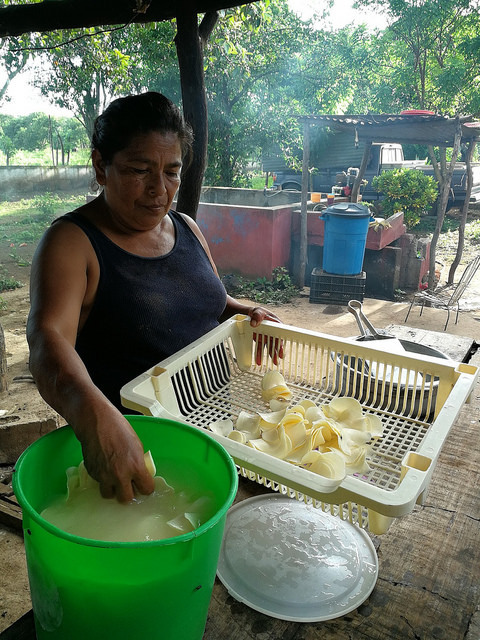 A quintal of fresh cassava is sold at 140 córdobas in the market, while once transformed, she can earn on a good day 1,200 córdobas (approximately US$40). Lack of dietary diversity is often at the root of malnutrition among the poor. Non-staple legumes such as beans and vegetables such as amaranth can increase diet diversity and make it more balanced, but they tend to be underutilized, researchers say. 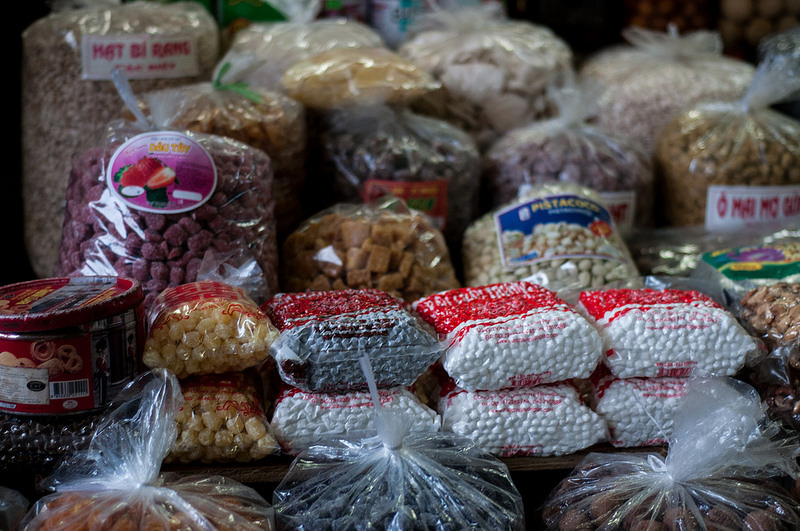 Although foods made with multiple ingredients – cereals, legumes, and vegetables – already exist, they are not tailored to low-income populations. Instead, industrial food processing caters mainly to middle- and high-income consumers. Nutritious foods are developed, produced, distributed, and marketed in ways that do not take into account the economic and social circumstances of poorer consumers. 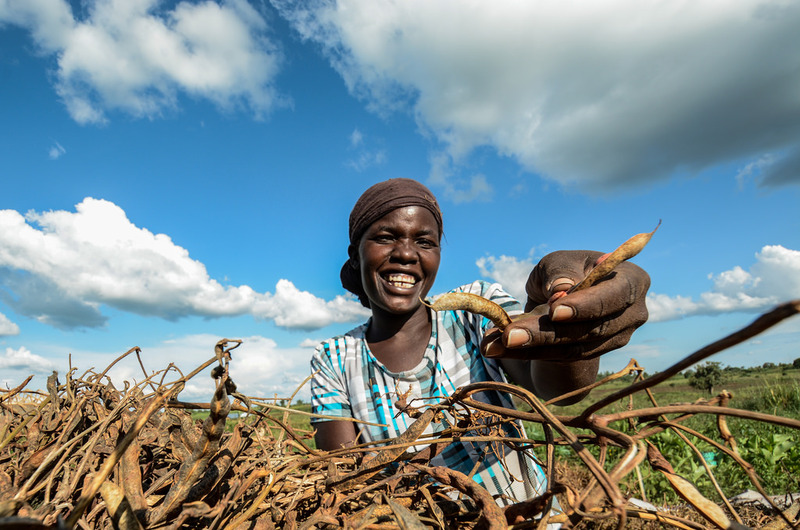 By taking a holistic approach, CIAT and partners are linking smallholder bean production systems in Kenya and Uganda to informal markets as a way to make affordable, safe, and nutritious foods readily available to the most vulnerable households in the two countries. CIAT carried out a survey in several poor neighborhoods and slums of Nairobi in Kenya and Kampala in Uganda, focusing especially on the dietary habits and preferences of women aged 15 to 49 years and children aged 6 to 59 months. CIAT and partners then recommended the formulation of porridge flours made of multiple ingredients sourced directly from local farmers associations and that build on the diversity present in the local production systems: millet, beans, amaranth leaves, grain amaranth, sweet potato, maize, cassava, and pumpkin. No nutrients will be artificially added. 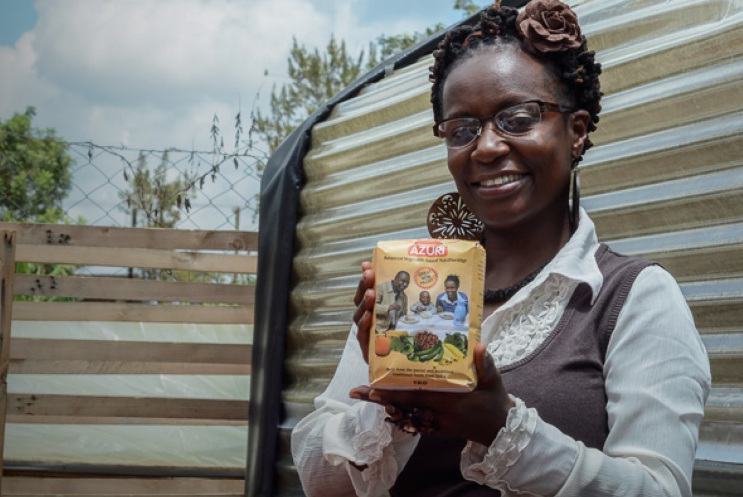 Two local companies, partners in the project – Azuri Health Limited in Kenya and Nutreal in Uganda – are launching specially formulated, bean-based porridge flour in April/May 2018. “While a family may not have the resources to cook dry beans, vegetables, and cereals three times a day, they can boil the porridge, which is nutrient dense and affordable, as an ideal supplement in the diet,” said Dr. Christine Chege, agricultural economist and nutritionist at CIAT Nairobi office. CIAT’s LINK Methodology is being used to make the trading relationship between buyers and the farmers associations from which the products are sourced, inclusive and focused on nutrition outcomes. Five hundred farmers in the Nairobi area, for instance, are currently growing improved beans, which can yield double the price of local varieties. While one bag of beans generally goes for US$34, Azuri has promised US$58 to use the beans in their flour formula. Solar bubble driers have also been installed as part of the project and offer a low-cost, energy-efficient alternative to open sun drying, a traditional method associated with important physical postharvest losses, nutrient leakages, and contamination. The driers retain bean quality and commercial value and preserve all the nutritious qualities before the beans are turned into the porridge flour. The technology is being tested with farmers and processors also with other commodities such as amaranth leaves and seeds, maize and cassava in Kenya and Uganda to improve food safety, nutritional value, and profitability before being introduced more widely. The project, which is called “Making Value Chains Work for Food and Nutrition Security of Vulnerable Populations in East Africa,” aims to reach 50,000 rural and urban consumers in Kenya and Uganda. The project is a three-year initiative (2016–2018) supported by BMZ and GIZ; the CGIAR Research Program on Agriculture for Nutrition and Health; and CGIAR donors. It is a joint project between the Pan-Africa Bean Research Alliance (PABRA) initiative and CIAT. The project is led by CIAT, in collaboration with the University of Hohenheim (UHOH), the University of Göttingen (UGOE), Kenya Agricultural and Livestock Research Organization (KALRO) and the Ugandan National Agricultural Research Organisation (NARO). A study published in the Journal of Nutrition shows for the first time that eating beans bred to contain higher level of iron can boost cognitive performance. For 18 weeks, 150 female Rwandan college students aged 18 to 27 ate two meals with iron-biofortified beans per day and realized significant benefits. As the iron levels improved in these women, so did their memory and attention capacity — both critical for reaching their full potential in the classroom and in life. The iron-biofortified beans were developed at CIAT using conventional plant breeding to contain almost twice as much iron as common varieties. 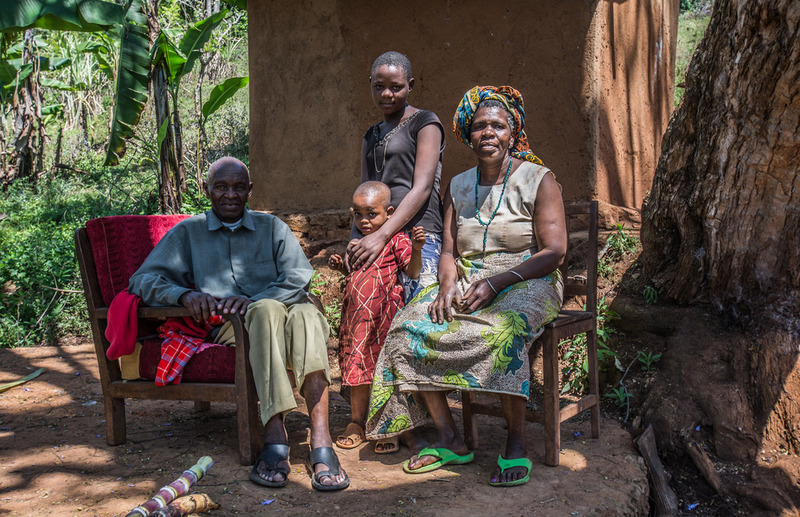 In Rwanda, nearly one in five women are anemic, and approximately 33 percent of anemia in sub-Saharan Africa results from iron deficiency. Iron deficiency is the single biggest nutrient deficiency in the world and mostly affects infants, children, and women of childbearing age. It affects physical strength, memory, attention span, and behavior – yet the physical and mental consequences of iron deficiency are often ignored. “Our work highlights that iron deficiency may disadvantage young women in their academic prospects and careers. Without addressing malnutrition, we cannot expect our people and economies to reach their full potential. Our young people are behind in the race before it has even started,” Dr. Mercy Lung'aho, CIAT nutritionist, added. Solutions such as high-iron beans do exist, but are not streamlined into policy to address healthier diets. Beans are commonly eaten as a part of almost every meal in Rwanda. Scaling up iron-biofortified beans can improve health in the region and in populations elsewhere that similarly consume beans, without changing eating patterns. Policy makers could consider including iron-biofortified beans as part of national strategies to overhaul food systems on the continent. This study was supported by grants from CGIAR initiative HarvestPlus and the International Food Policy Research Institute (IFPRI), a CGIAR research center. What are the dietary habits of people living in Cali, Colombia? That was the starting point for the “Cali come mejor” [Cali eats better] initiative, one of the first projects of “FoodLens”, which aimed to generate new knowledge and interventions to enable urban and rural consumers to access healthy food. The preliminary findings show that people in Cali suffer malnutrition. Despite the diversity of causes, what we know for sure is that there is a high consumption of industrialized foods, and the lack of economic resources is also a limiting factor for Caleños to eat healthy diets. 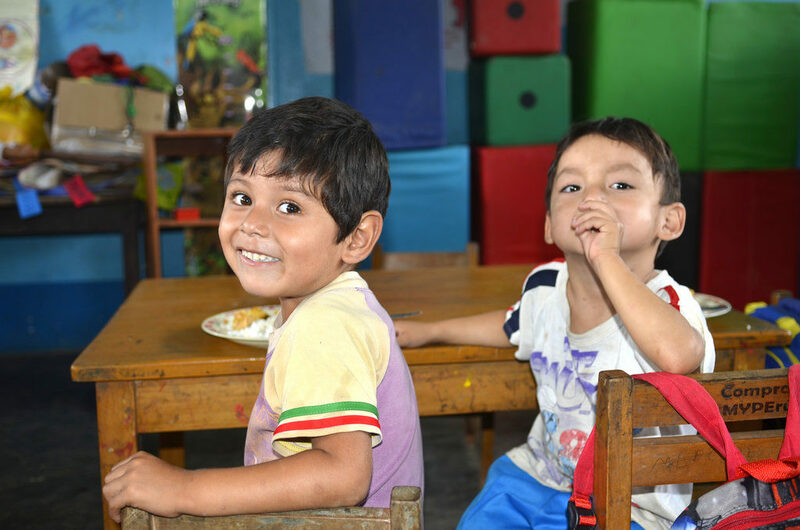 The research study led by CIAT also found that sausages, canned and packaged food and sugar-sweetened beverages are protagonists on Caleños’ tables regardless of their socioeconomic status. This, coupled with other inadequate dietary habits, has resulted in overweight (37.6%) and obesity (22.4%) in 60% of Caleños older than 18 years old, according to the National Survey of the Nutritional Situation in Colombia carried out by the Colombian Family Welfare Institute (ICBF) in 2015. And minors are no exception. 34.9% of children between 5 and 12 years old are considered to be overweight (22.6%) and obese (12.2%); and 23.4% of teenagers between 13 and 17 years old also have overweight and obesity. This is worrisome, especially when compared to the 2010 survey, which shows that 53.9% of Caleños between 18 and 64 years old were overweight. In parallel to overweight and obesity, malnutrition prevails in Cali also due to nutritional deficiency, which means that there is a double burden of malnutrition affecting particularly children under 5 years old. According to the Secretariat of Public Health of Cali, for these children, the city reportedly shows rates of acute malnutrition at 4% and growth delays at 6.79%, thus reflecting a lack of nutrients throughout their lives. Within this framework, CIAT and partners developed between 2015 and 2017 the “Cali eats better” project with funding from the Ford Foundation and scientific support from the French Agricultural Research Center for International Development (CIRAD). The project aimed to analyze the food system to contribute strategies to streamline its functioning, while benefiting low-income consumers and farmers. It was also intended to mobilize the food system actors and advance the Municipal Public Policy for Food and Nutrition Security for Santiago de Cali, developed in 2009 but still not approved by the Municipal Council. A component of the study about the food system in Cali, particularly on consumption, included households with similar socioeconomic characteristics and made possible to identify the influence of industrialized foods, local dietary habits, and who decides what to eat and what drives that decision. In particular, it included households with children and teenagers between 10 and 14 years old to determine how healthy habits start at those ages. “The new generations are strongly influenced by the consumption of ultraprocessed food, where factors such as taste preference, high supply, packaging, and the environment that offers diverse foods at low prices have a high incidence,” says researcher Jenny Peña, who collaborated with the “Cali eats better” study. Most of the survey respondents know which foods they need to be healthy. However, the diet quality is determined by social and economic factors. For socioeconomic strata 1, 2 and 3 (low, low-middle, and middle), money availability is crucial to decide what to eat. On the other hand, people in strata 4 and 5 (middle-high and high) may have the resources to buy higher quality food, but the lack of time for meal preparation opens up the door for processed foods that require less cooking time, or other options such as home meal delivery services or eating out. The strategy for helping Cali eat better includes, among other initiatives, forging partnerships to achieve shorter circuits along the supply chain so that food products are delivered at low costs and with better quality to the final consumer. For that reason, local neighborhood stores and mobile farmers markets are important allies in the chain to influence community members in the decisions they make on their daily menu, by offering quality fruits and vegetables at affordable prices. Another action front proposed by the initiative is aimed at establishing school vegetable gardens as a learning platform. A further option would be to work hand in hand with the actor that manufacture these foods: the industry. For Henry, the goal is to ensure that the industrial sector self-regulates advertising of unhealthy food, clear nutrition information on their product labels, and governmental controls for follow-up. The findings of the first phase of the “Cali eats better” research study were shared with Cali Mayor’s Office–Technical Working Group on Food and Nutrition Security, comprised of the municipal Health, Education and Social Welfare Secretariats; University of Valle; National University of Colombia; Autonomous University of the West, ICESI University; Colombian Family Welfare Institute (ICBF); Municipal Unit for Technical Assistance in Agriculture (UMATA), Cavasa wholesale distribution market, shopkeepers association, various social organizations and NGOs. CIAT researchers studied the changing diversity over the past 50 years of 53 crop commodities* that contribute calories, protein, fat, and food weight to humanity’s diet. While researchers dove into this data searching for evidence of the gradual disappearance of the variety of crops in people’s diets, what they found instead is massive change in the foods people eat. And most of all, evidence of the increasing similarity of the food supplies of countries worldwide, thanks to economic development, urbanization, and other facets of globalization. 1. Almost everybody eats a lot more, and more diverse food than their grandparents did. Unsurprisingly, everybody eats more food (on average more than 500 more calories per day) than their ancestors. More surprisingly though, most countries’ food supplies have become a lot more diverse. For instance, Southeast Asia has diversified over time from a diet based on rice to include other staples such as wheat and potatoes. The same is true for maize-based diets in Latin America, sorghum- and millet-based diets in sub-Saharan Africa, and so on. The United Arab Emirates, for instance, reported a 330% increase from 1961 to 2009 in the number of crops contributing to calories in the national food supply, diversifying well beyond its initial reported monotony of rice, wheat, sugar, and dates. 2. African, Asian, and small island countries have the world’s most diverse food supplies. Also the least. Looking both at the number of crops in national food supply data, and the relative contribution of each crop to the diet, Cameroon, Nigeria, and Grenada appear to have the world’s most diverse food supplies with regard to calories. Afghanistan, Bangladesh, and Cambodia, meanwhile, had the least, with Afghanistan getting 74% of its calories from wheat alone. 3. Crop immigrants are the key to dietary diversity. In related research on the origins of food crops, researchers found that about 69% of plants consumed around the world are “foreign” in the sense that they are originally from distant regions of the planet. If there were crop “winners” over the past 50 years, among these would be the “mega-crops” (wheat, rice, maize, and sugar), which clearly defended their global importance. The biggest winners, though, were oil crops such as soybean, palm, sunflower, and rapeseed, which progressed from regional significance to global dominance as contributors of calories and fat over five decades. As the winners came to take more precedence in food supplies around the world, traditional cereals such as sorghum, millets, and rye, and starchy roots such as cassava, sweet potato, and yam, were marginalized. 4. The world’s average diet means eating like people do in Cape Verde, Colombia, and Peru. The compositions of the countries’ food supplies seem to be converging mostly toward European- and North American-type food supplies, with a few surprising additional countries in the mix. African, Asian, and Pacific island countries remain the furthest distance from this convergence, and pull the current global average diet some distance away from the main cluster. In the current decade, the nations that most closely reflect the global average diet include Cape Verde, Colombia, and Peru. And while the figure clearly shows that there is no such thing, in reality, as a global average diet, the visualization through time bolsters the argument that the idea of a global average diet has more validity now than it did 50 years ago. 5. Political unrest can lead to greater diversity in people’s diets, or less. Exploring the food supplies of countries such as Albania, Argentina, Cuba, Myanmar, Nicaragua, and Venezuela makes it pretty clear that periods of political unrest correlate with the disruption of people’s access to an abundant and diverse food supply. This is not surprising, but what happens in food supplies after the shock is. In some cases, such as in Cuba’s Período Especial (early 1990s), the total quantities of food declined, and in fact still haven’t fully recovered. Yet, the diversity of crops within the Cuban food supply increased, for example with regard to fat, as the country consumed more soybean and palm oil in order to adjust to the declining availability of the sunflower oil that had previously been imported from the Soviet Union. In other cases, such as the fall of communism in Albania, disruption seems to have led to greater total quantities of food. At the same time, though, the diet became even more dominated by wheat. 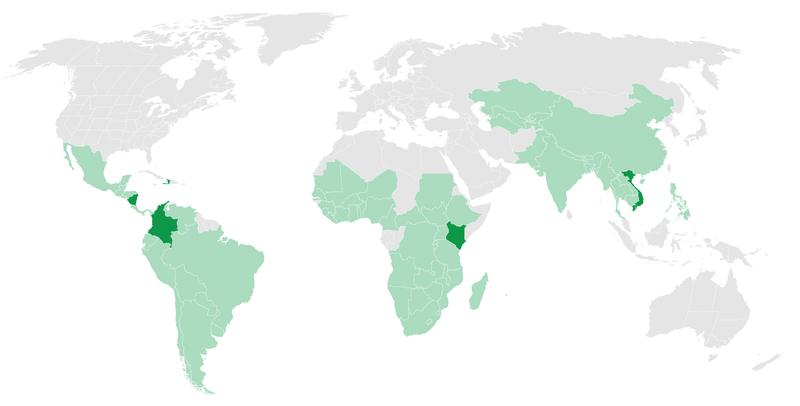 * Measured in United Nations Food and Agriculture Organization statistical data (FAOSTAT). Animal foods were included as a single commodity where needed to place the findings in the context of the total food supply. The changing global diet. The Changing Global Diet site provides interactive explorations of changing food supplies for countries worldwide over the past five decades. News out late last year on the state of global hunger provided troubling updates on much of Africa. Despite progress throughout the continent over the last decade, the 2017 issue of the Global Hunger Index (GHI), which measures progress and failures in the global fight against hunger, found that six countries in Africa were rated as having alarming or extremely alarming hunger situations. The only non-African country in this group was Yemen. This is disheartening because Africa is also the only region in the world where malnutrition is on the rise. Africa is home to 22 out of 34 countries with the most children suffering from malnutrition, and governments are losing up to 16.5 percent of their gross domestic product (GDP) annually as a result of poor nutrition. As a nutritionist, I cannot look the other way while women and children are dying of poor nutrition on our watch. And I believe that despite this grim portrait, we can end hunger and malnutrition. To do this, however, we need an all-hands-on-deck approach: we need civil society to be a better watchdog, advocate, and incubator for solutions. A key challenge in addressing the issue of poor nutrition is that it lacks a clear institutional home in many governments. There is no country that has a “Ministry of Nutrition”, and so ministries of agriculture or health are allocated funds to help reduce hunger and malnutrition among vulnerable populations. And as a result, those funds are harder to keep track of. That’s where civil society and activists come in. To serve their watchdog function, they need to hold institutions and governments accountable for national investment in these sectors. They must make sure that activities that can address hunger and malnutrition are prioritized and sufficiently funded – and that those funds are monitored and their results fully accounted for. To end hunger and malnutrition in Africa, we must put money where we have the best returns on investment. We must also focus on nutrition for specific populations if we want long-term growth. Africa will make little progress if we do not quickly prioritize improving adolescent nutrition. As the continent’s youthful population grows, our children are going to school hungry and unable to focus, to learn or thrive because malnutrition affects their brain power. Yet our children have a right to nutritious food. The World Food Programme has played a key role in setting up school feeding programs as short-term safety nets for children and families. Converting these nets into trampolines that will catapult the next generation into a better future requires government and community involvement to enable sustainable long-term social investment. 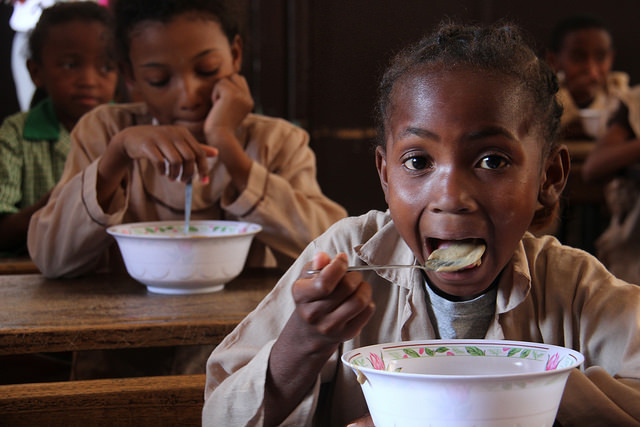 To ensure that all kids have access to the nutritious meals that will also help them learn, we must advocate for a policy on universal school feeding programs in Africa. These solutions won’t just come from government, though. Grassroots movements that support nutrition and health should demand nutrition be a priority and track commitments at the local level. This will pave way for young people to be guaranteed at least two simple but nutritious meals per day in school – a move that will help end hunger and malnutrition while nurturing them to be tomorrow’s leaders and innovators. All is not lost, as we have some success stories nutrition advocates can learn from. A key challenge in addressing hunger is shrinking land for agriculture due to population growth. In hard-hit agrarian countries such as Rwanda, for example, CIAT has developed climbing beans (the type that climbs up stakes like a vine) that use less land space but yield three times more than the familiar bush type. Such a simple innovation can ensure food security for densely populated, land-scarce countries in Africa. Meanwhile, an emerging issue for African countries is the need to reduce post-harvest food losses and waste to help curb hunger. What innovative solutions could be adapted to local circumstances and contexts in this case? As the GHI report puts it, the global goal on hunger is to ‘’leave no one behind’’. This means that practitioners and all parts of society must endeavor to reach first those who are furthest behind – those in Africa who are most vulnerable to hunger and poor nutrition. To achieve that, we must focus our efforts through more effective partnerships, be innovative with local solutions from all sectors, and ensure we focus first on the children who need nutrition the most to ensure the strongest future. A disconnect between what science says and what is supported (or unsupported) by policy has been a subject of debate for as long as one could remember. “Climate change” is not spared this gap between science and policy, primarily because of the lack of effective communication between scientists, policymakers, and private sector leaders. This was the observation that originally led us to create the Climate Policy Hub or CPH. When we launched the CPH in April 2017 to work in Asia, our guiding light was the desire to provide a communication and collaboration platform among researchers, policymakers, and the private sector on the work towards climate-smart agriculture. At that time, we had no idea how its structures or operating mechanisms would later evolve. All we knew was that we needed to do more for scientific knowledge on climate change to directly feed into climate policy and influence action on the ground. Over the past 12 months, we’ve seen some exciting developments in CPH’s work. From initially working with Southeast Asian governments – Vietnam, Philippines – we have extended our reach into South Asia, beginning with a series of climate-smart agriculture (CSA) profiles for Bhutan, Nepal, Pakistan, and Bangladesh. Following the work in Bangladesh, we joined efforts with the World Bank to develop an agricultural economic model to support their Climate-Smart Investment Plan project. Structures-wise, we have set up a growing Partnership Council comprised of diverse institutions – Food and Agriculture Organization of the United Nations, World Bank, Grow Asia, GIZ, and World Business Council for Sustainable Development – to advise the CPH on a timely and relevant research agenda, as well as on ways to effectively engage with both the public and private sectors. By sheer demographics and its current development stage, Asia is both highly vulnerable to the impacts of climate change on agriculture, and a huge contributor of carbon emissions. The way we do agriculture has to be transformed if we are to ensure food security for hundreds of millions of people in the region. To this end, we need to improve the way science and policy, evidence and action, talk to each other. And that is the mission of the Climate Policy Hub.